Although I have not been writing posts, that doesn’t mean that I haven’t been doing creative style work. The journey and the work has been slow going as I’ve been pulled away attending to medical matters and it has been getting more and more difficult to do the physical portion of a lot of the work that I do. But I have quite a few projects that I have been able to finish (or are near to finishing) and I want to get them written. I have made a promise to myself to try and finish as many projects that I’ve already started before my surgery as well. Wish me luck! As a consummate crafter, I am always stumbling onto materials that might be good for something someday. Every so often I review my piles and make a concerted effort to use up or donate as much as I can before collecting more. Such as the case with this project. When I picked up a dresser back a while, I noticed another one in the corner of a garage literally falling to pieces. It wasn’t salvageable but it had the greatest drawer fronts. And intricate design carved into the three remaining drawer fronts caught my eye and the offer to dispose of the piece made it mine. Recently, The Kid was away for a few days and of course, being a mom, I sneaked into his room to pick up dirty clothes and dishes. Wow, is this kid messy! I realized that some order and organization was needed. Everything seems to end up on the floor! Quite a bit of his stuff seems to end up on the stairs too and with the condition of my knees, I need to have them clear. One of the things I noticed that he seems to acquire a lot of is hats! And when I started to think of ways to store them in a useful and decorative way, the drawer fronts came to mind. 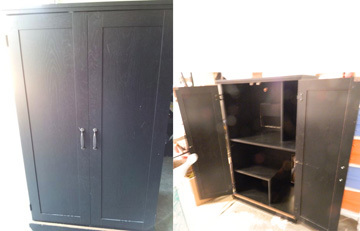 I pulled them out and gave them all several coats of his room’s signature black paint – Deep Space from Behr. I’ve taken to using high gloss finish and it just looks so bold and sharp. 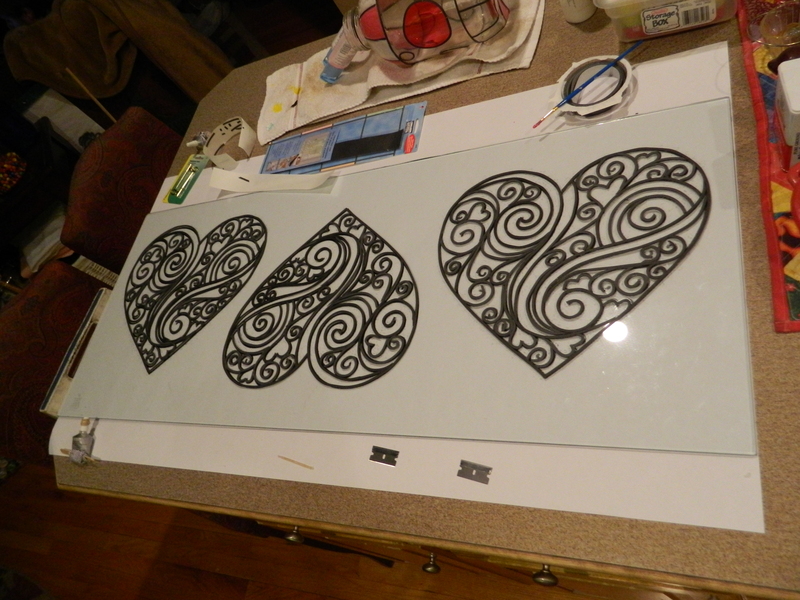 Then, using paint pens, I traced the lines. Since originally this was intended to be in The Kid’s room and his (sort of) recent room update utilizes the black paint with a red accent, that is the same direction I took this. 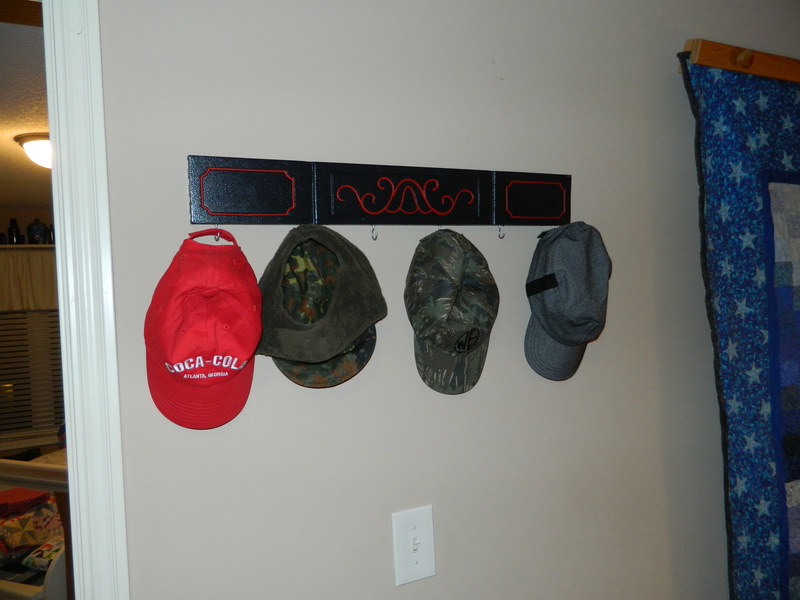 Then it was just a matter of adding hooks at the bottom from which the hats would hang. Once I finished and showed The Kid, his reaction was to let me know that while he liked it, it wasn’t really the style of his room. His room is more industrial, with a lot of pipe and leather (if you’d like to check out the reveal of his makeover, you can see it here). 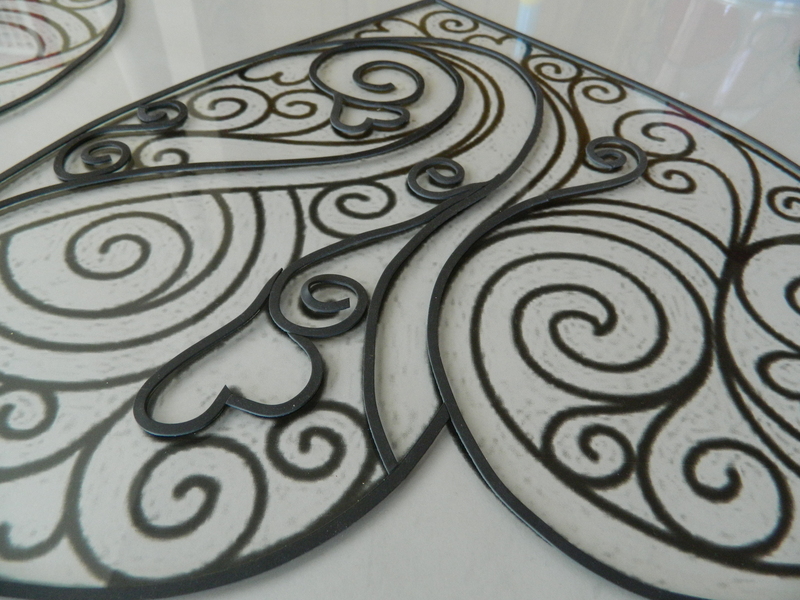 This turned out to be a bit more traditional with the specific style of engraving. So, while I agreed it didn’t match his style, he still needed it to be a bit more organized, so we agreed to place it in the hall at the top of the stairway. That way, he could grab the hat of choice on his way down the stairs and hang the hat back up when coming back. 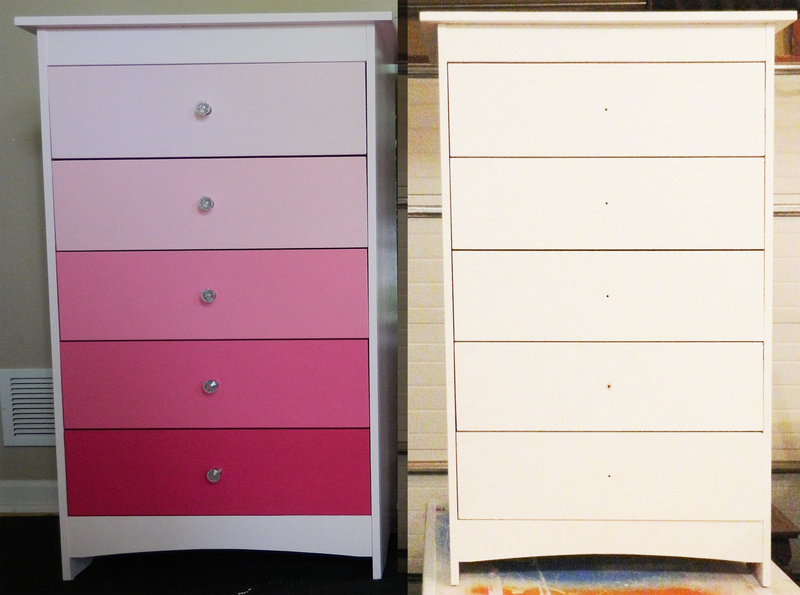 The other two drawer fronts received a similar treatment but different colors. I have another project in mind for those and when I complete it, I will share it here. Stayed tuned for more completed projects! I feel like I haven’t written anything in a long time, and if you don’t count the last two quick posts about my “ible”, it has been more than a week. Doesn’t mean I haven’t gotten things done though. I think I may just be getting a little lazy about documenting it. So, a couple of previously finished pieces have been sold and making a bit of room in both the house and the garage. It almost seems that there is a ebb and flow to how the pieces sell. I will have a few pieces for a while, adding to them as I complete projects and then all of a sudden a bunch of things will sell. But sell they have and I am happy to have some cash to begin new projects. First up, I wanted to provide an update on our gardening. We finally had a break from the rain and we were able to get the corn planted into the garden. We stacked grass clumps around the two sides to help deter the little rain stream that is created every time it rains. We also planted additional seed, such that we could get some kind of result. The Kid wanted to keep one stalk in a bucket, sort of as a control subject. I like to have him take an interest in something other than his constant computer use. I am trying with all my might to make him a well rounded young man. My tomatoes have also been transplanted into their containers. Its has been a hit or miss with the watering so thankfully I started with more starts than I will eventually need. 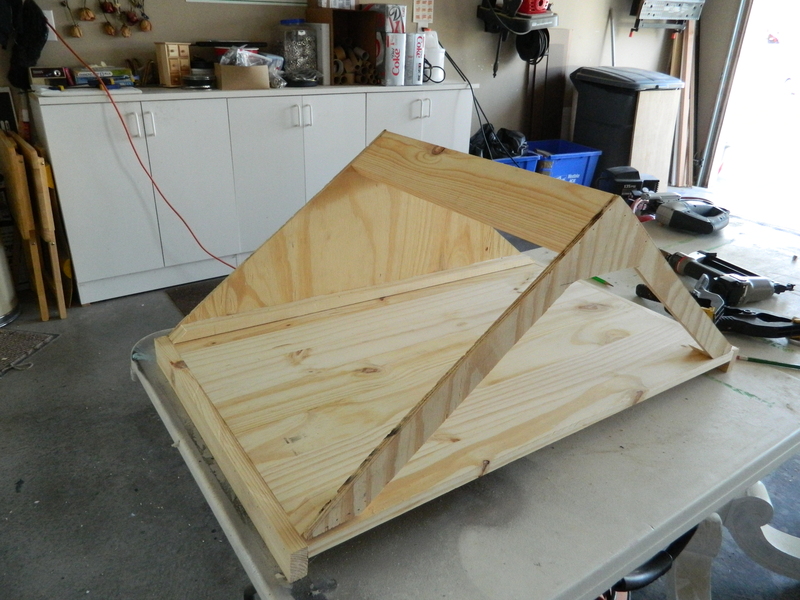 I still need to complete my plan for the supporting structure, what I plan to use in place of tomato cages. They are still quite little, so I have some time. 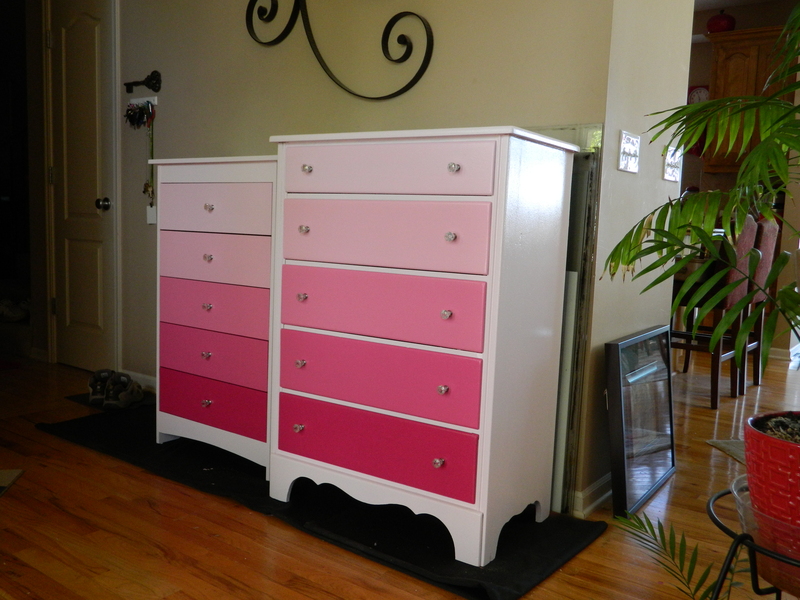 The next project that I am working on is another ‘suitcase’ dresser. I love these and have quite a bit of the materials on hand for them. They always seem to sell quickly, too. 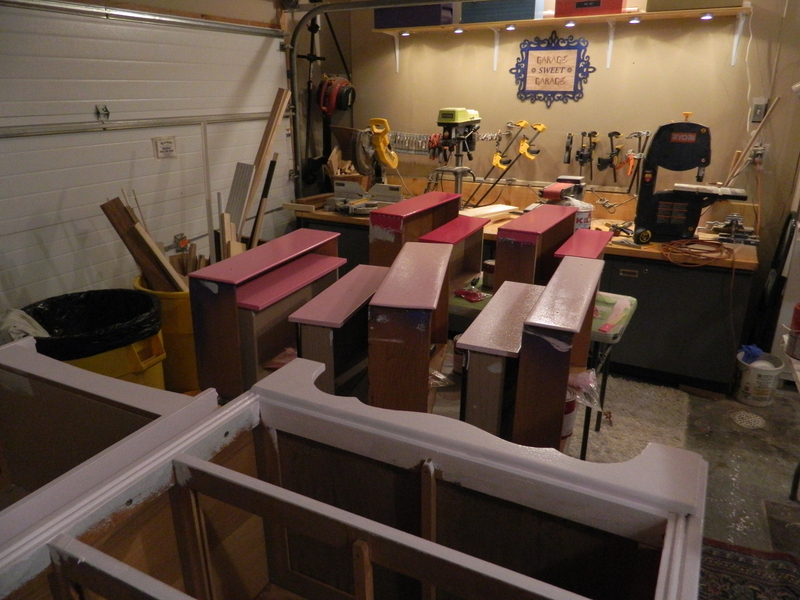 This one I opted to paint the box in the aubergine color (used on the little Aubergine Victrola cabinet remake). One of the things I love the most about this particular project is that it allows so much creativity! There is something deeply satisfying about picking out the fabric, being able to look and touch all the different colors, weights, weaves and styles. And because I use a heavier fabric – usually used in upholstery – it is a whole new set of fabrics. 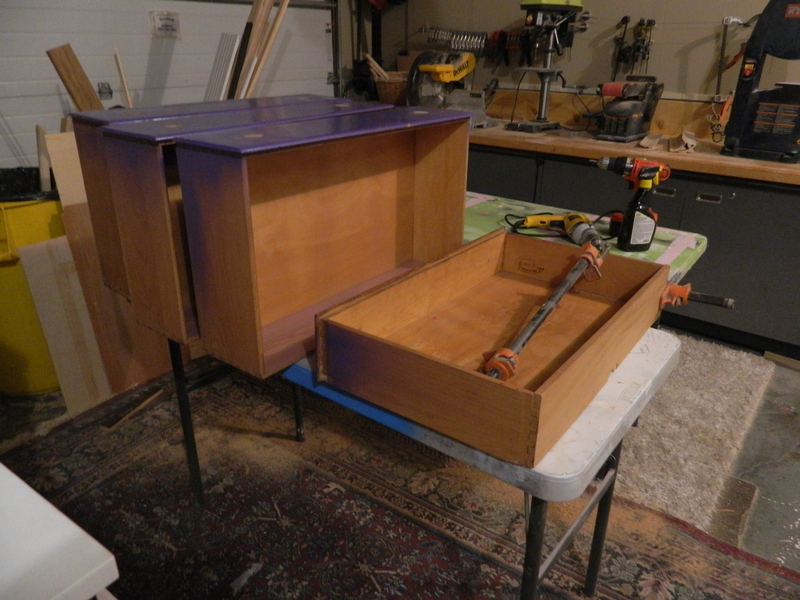 The drawer fronts, once I removed the molded plastic section – turned out to be nothing but 1/2″ fiberboard (and not in very good shape with what it took to remove the drawer front). 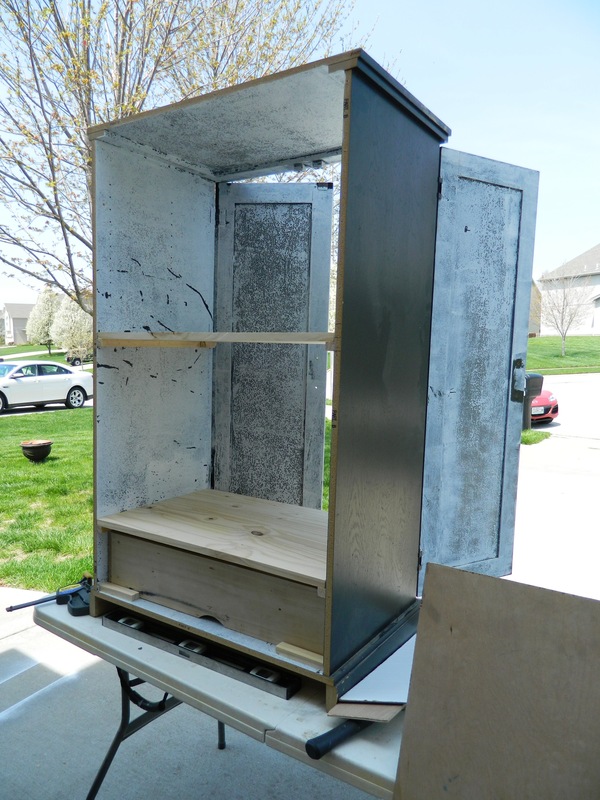 It took a few days of thinking, considering and exploring, and in the end I opted to just leave the fronts and cover it with a solid piece of 1/4″ high quality plywood. This would make it perfect for then doing the fabric “suitcase” fronts. 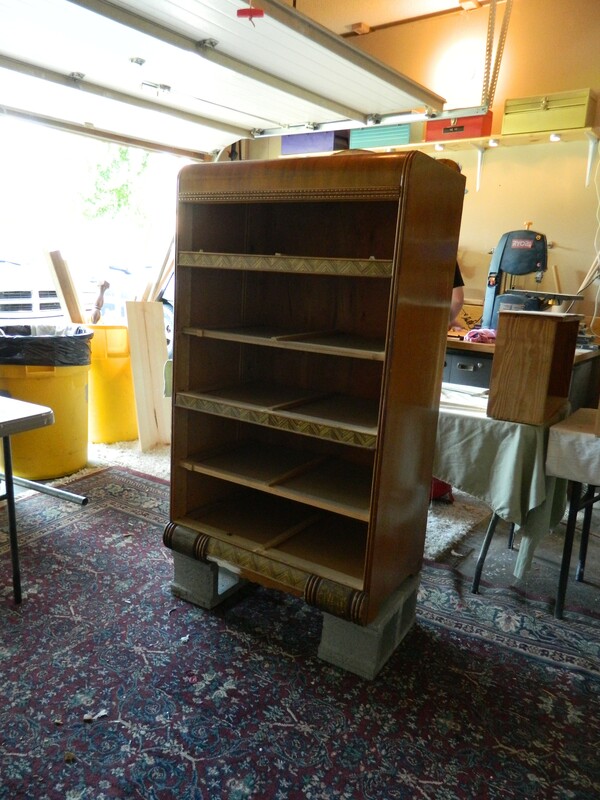 I also have been working on the very beautiful waterfall dresser. I had high hopes when I bought it that the veneer breaks could be repaired and with only a little effort, it could be restored to its natural beauty. Unfortunately, as I started attempting to re-glue the veneer, it literally just fell off. 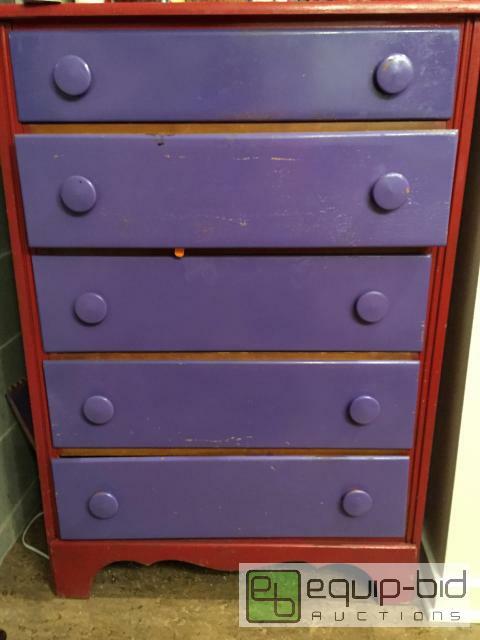 All the drawers were the same and I was just heartbroken! Unfortunately, after sitting in garages and basements, the elements were just more than that poor veneer could deal with. In my estimation and my opinion, the veneer – and more importantly the glue used to secure it – just dries out. There was just enough contact to make getting it off in single pieces impossible. If it had, I could have simply reattached all the pieces. It was just not to be. Sadly. So, now it is getting updated to a gorgeous ivory – Toasted Marshmallow, to be exact – and it will get new hardware. 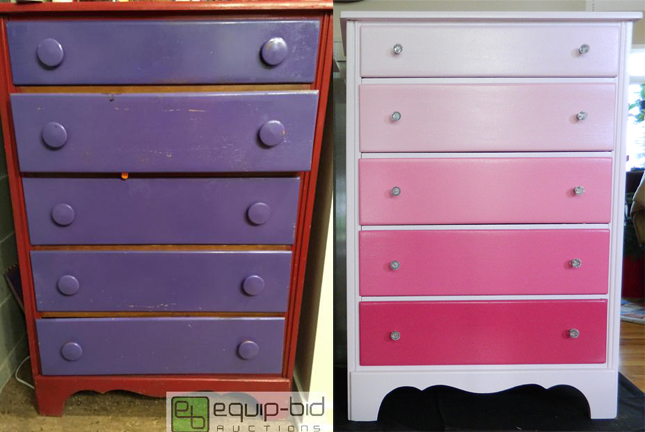 Oh, did I mention that the previous hardware on this dresser was immaculate! Not a scratch or break anywhere. 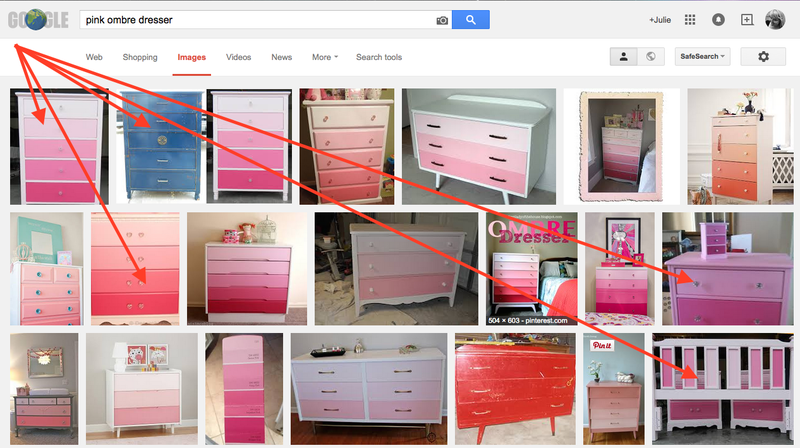 I don’t think that hardware really matches the style of the dresser once it was repainted though. I opted to list it on eBay and they sold for $65! I opted instead, to use hardware that I have in my arsenal. I often find hardware at different stores and yard sales and estate sales. Sometimes the hardware comes from an older piece of furniture that I rescued. In this case, these came from my local Habitat for Humanity ReStore. If you live close to one, you should check them out. And often as they get new donations all the time. And you are helping your community to boot! I had ten in two different styles that I wanted to ‘try out’. The dresser is impressive and needed something ‘large’ to compliment it. The style closer to you in the photo has won. 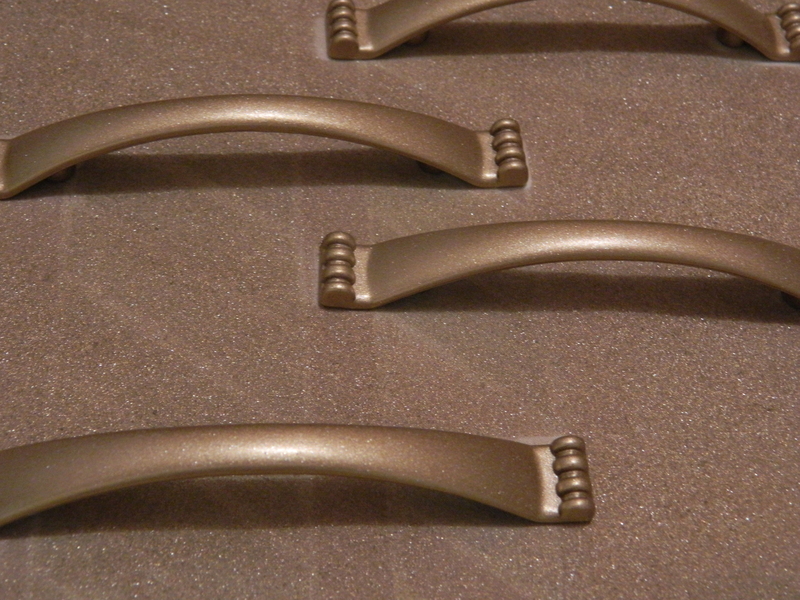 I love this color, it is a shiny gold with a hint of pink – it is actually named “Rose Gold” (from Rust-Oleum). 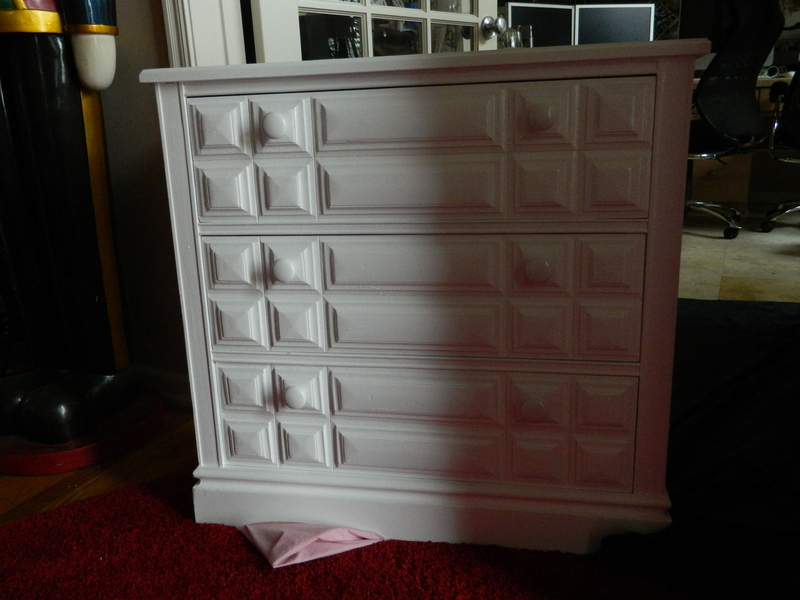 You can see in the corner of the photo a wood applique that I am also installing on the dresser. It too was painted. A closer look… I love the sparkles! Its beautiful in a quiet sort of way. As I mentioned, the veneer just fell off the drawer fronts, but the veneer on the body was in pretty good shape. I only had to patch two small areas, one on either side. 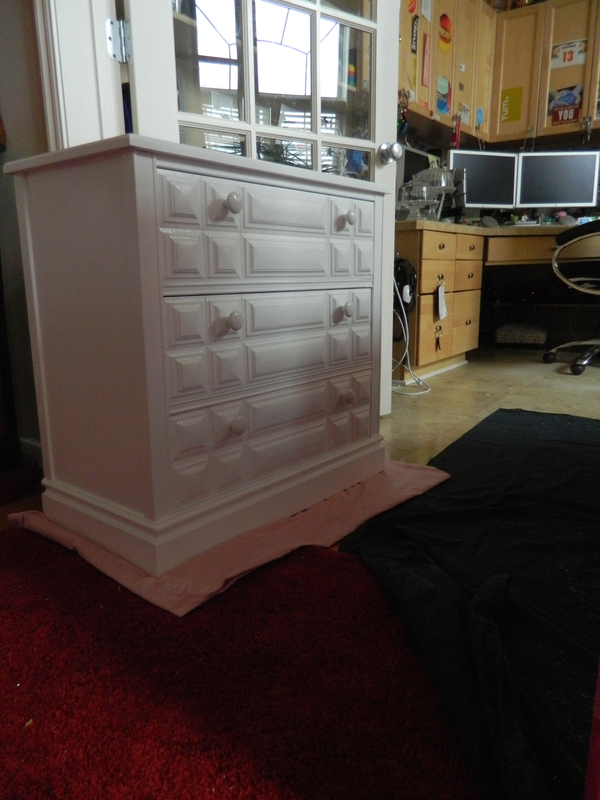 Here is the dresser following its third coat of paint. 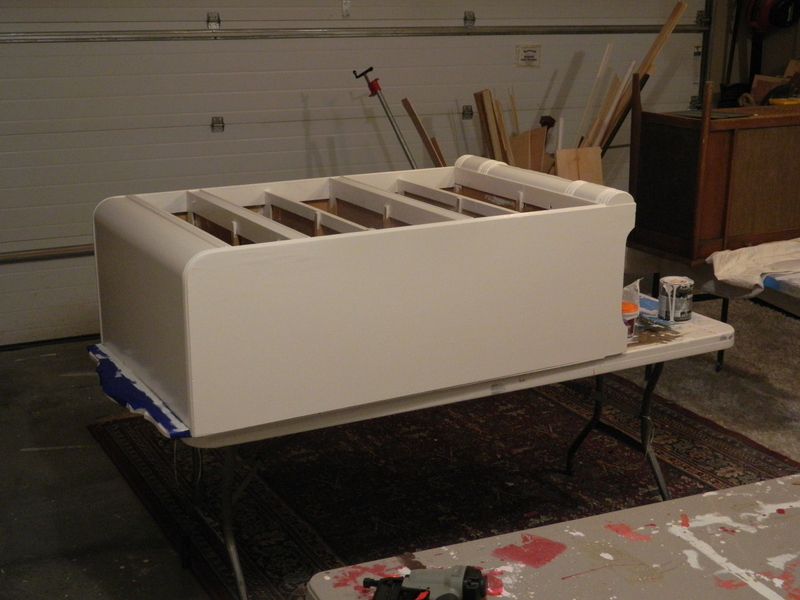 Here are the drawers, prep’d and ready for painting. And with three coats of paint that followed a primer layer. One last project in the works. 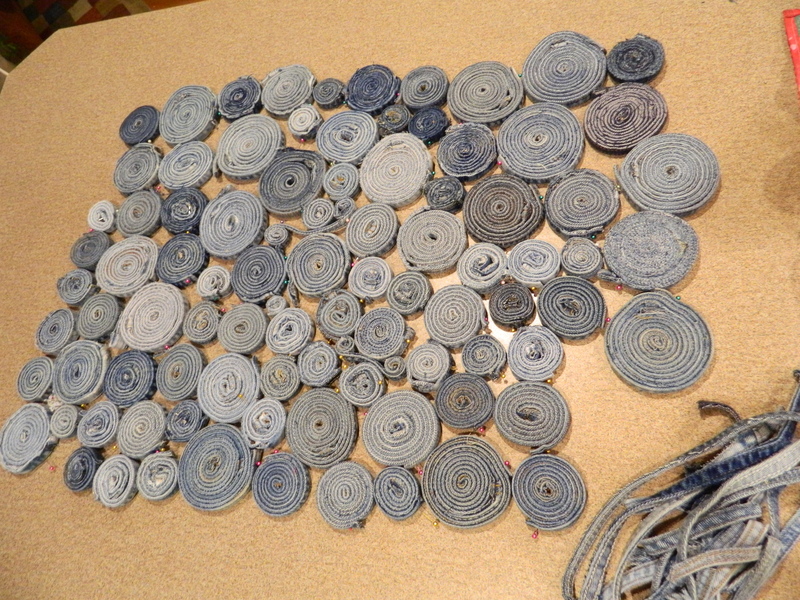 These are the inner seams from all those pairs of jeans that I took apart. I curled them up and secured with a pin temporarily. I think that this will make a very interesting rug and have to figure out how to permanently secure them and attach them to a rug backing. You see in the lower right hand corner of the photo that I have some not currently curled and am hoping to use them to fill in some of the blank areas in the form of little curlicues. There is a little more work to be done, obviously. This is one of the side projects of taking apart all of those pairs of jeans. I also started the project I hinted about in the deconstructing post. 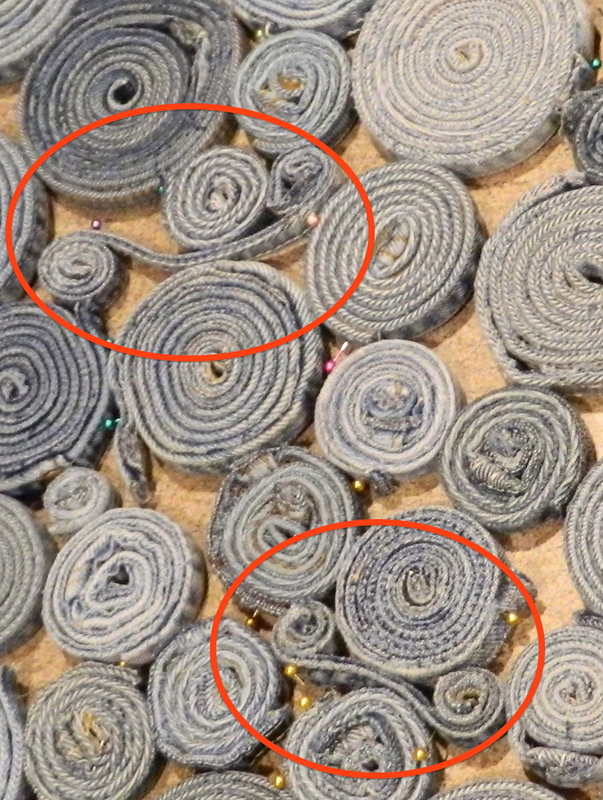 The problem is that working with so many layers in seams with only a standard sewing machine is that needles break. A lot. I went through 12 before I decided to order some heavy duty needles online and will wait to finish up when they arrive. 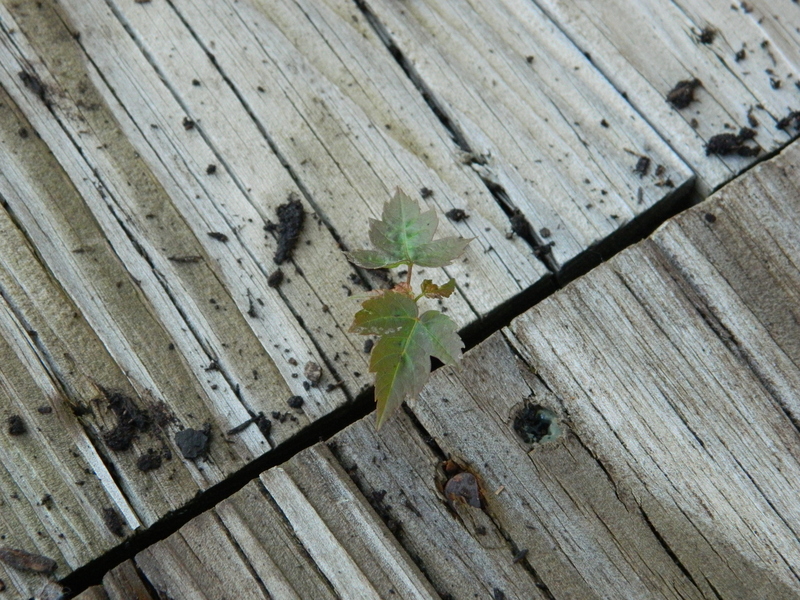 I found this little guy sprouting up from between boards in the back deck. I love how nature does what she wants! 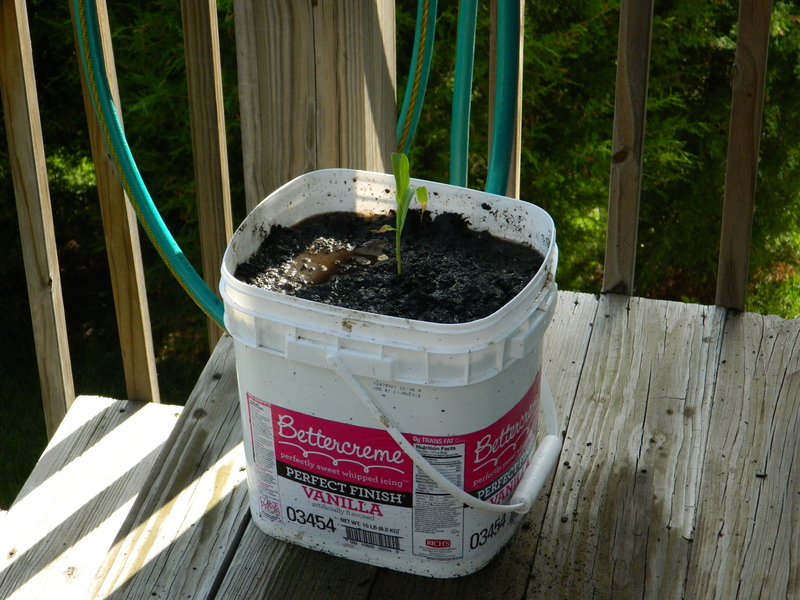 I pulled him up carefully (along with some from the front) and planted them in a long planter box on the back deck. I really would like to have tons and tons of trees on the property. And I love an underdog! This is gonna be a quick reveal. 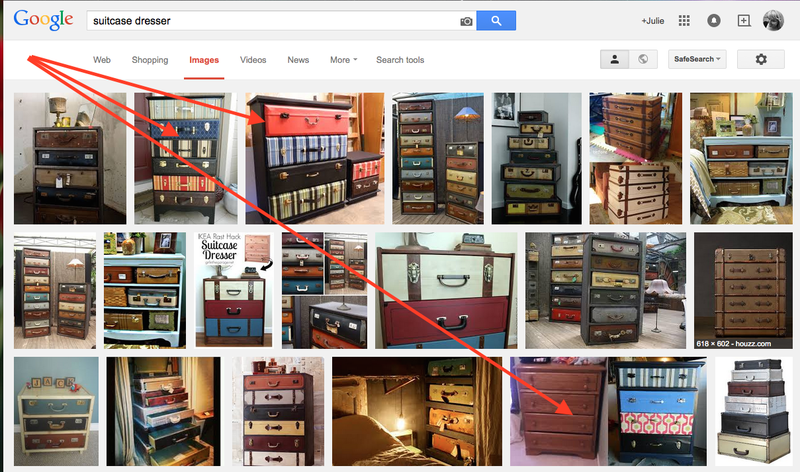 I have spent tons of time looking for a ‘before’ photo and I just can’t find one. I’ve got loads of photographs on several computers, my phone, The Kid’s phone and a camera; someday I am going to have to get serious about how I manage all those photos. And get into a regular routine on when and how to take photos. Anyway, back to today’s reveal. It was a cute little piece, had to be the 70’s timeframe judging from the styling and the use of a slab of granite. LOL All we really did was to clean it up, fix and build up the drawer supports, then prime and paint. Gets to be a regular routine. This time I went with the high gloss ultra pure white. The Kid put in a small lip around the original opening where the granite went, and I cut and then covered with felt a thin piece of veneer. It was then attached from beneath. 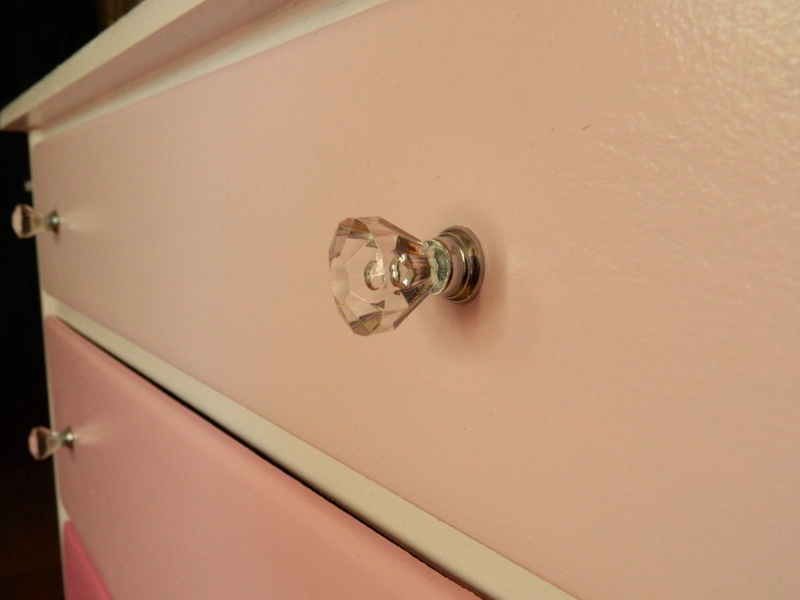 This piece was fitted with my favorite hardware: simple and clean white ceramic knobs. 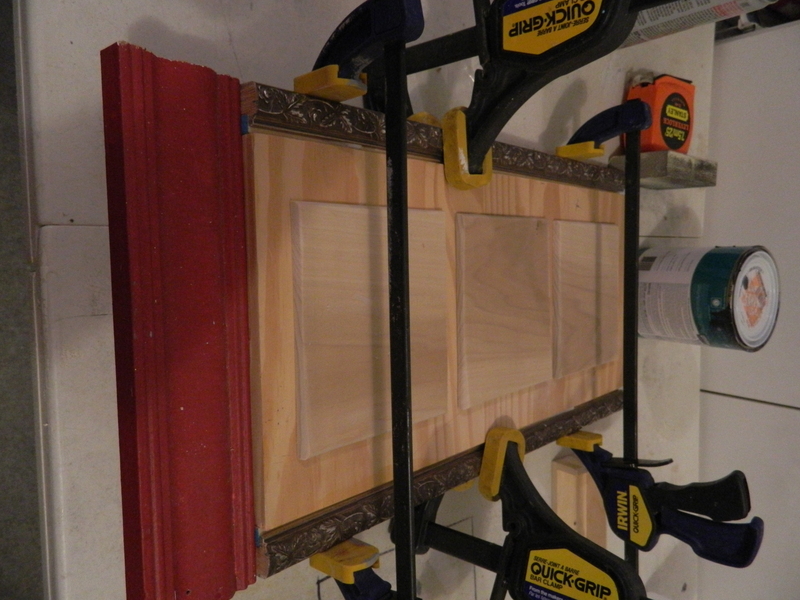 One more step to this one, was to cut a 3/8″ clear plastic piece to go where the granite had once sat. This gives the new owner a place to show off some small special pieces… there is about an inch or so there. I drilled a small finger hole in the upper right hand corner to allow one to easily pull off the top, but no so apparent that small hands would get in and play with something that wasn’t meant to be played with. My light wasn’t the best, storms were moving in about the time I pulled the camera out. 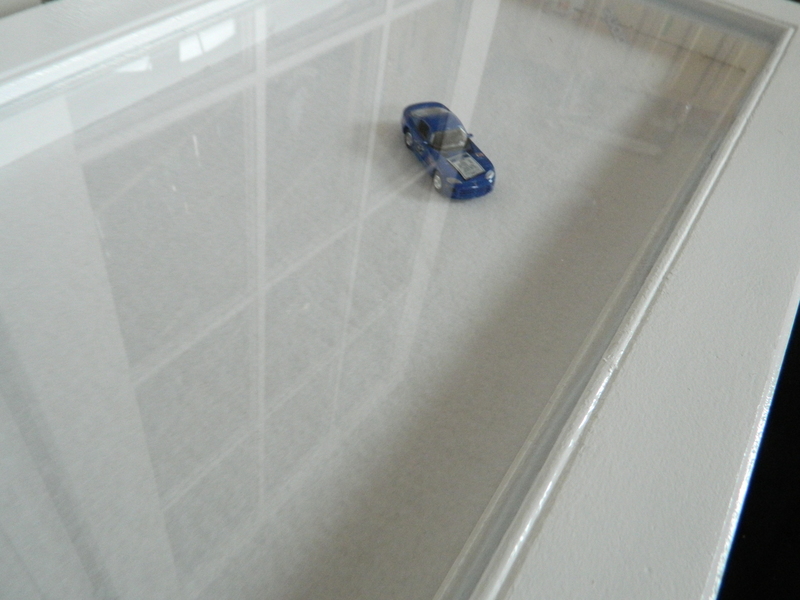 Here was a test of the depth… it easily held a hotwheel car (this was part of my Monopoly collection). It wasn’t deep enough for a PEZ dispenser though. Another angle. That plastic is really nice. As nice as glass, but far more durable. One final shot. If you can imagine this in the 70’s signature dark brown with a piece of brown granite on top, there’s your ‘before’ shot. I very much like the ‘after’ shot myself. More coming. This is feeling very refreshing, my personal quest to finish projects already started before beginning anything new. Now to just get them all sold so I have money for more projects! Ha! 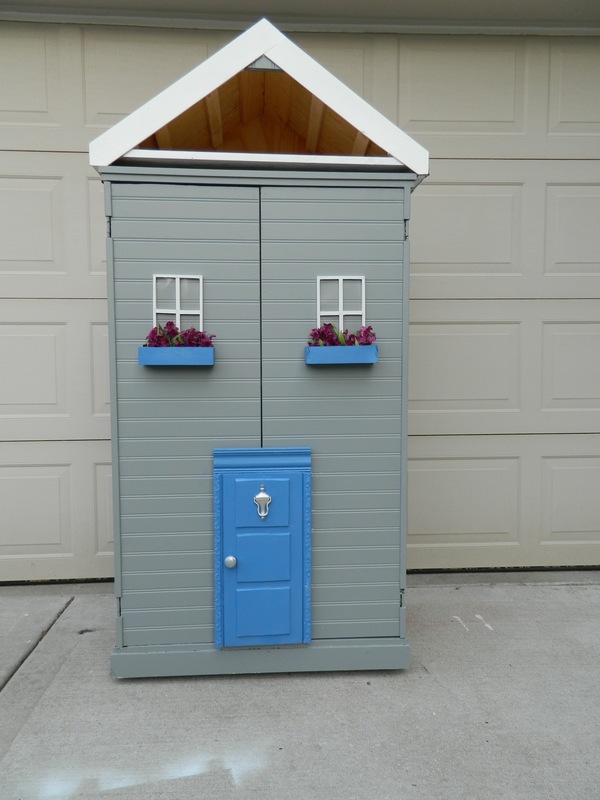 Last few details have been completed and the doll house is ready for delivery. 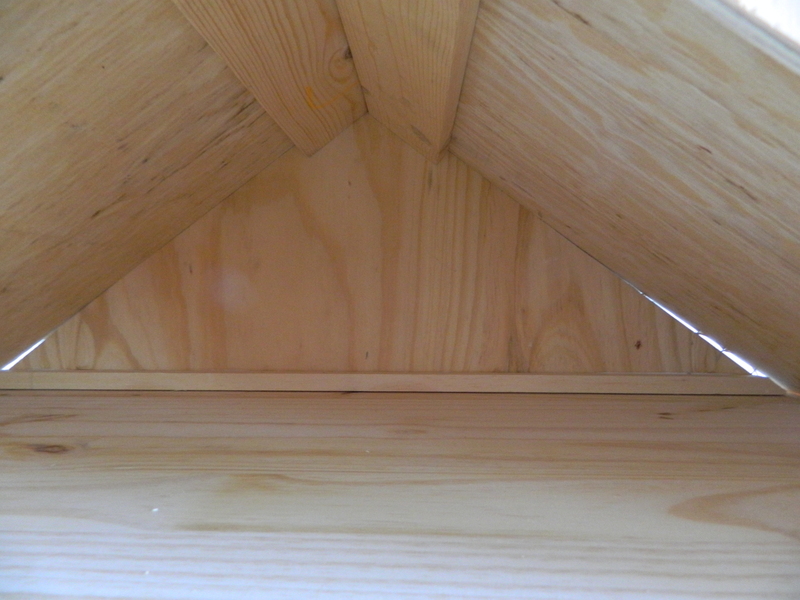 You may notice that there is a small gap between the “attic” and the rest of the cabinet. That’s simply because they are two parts, created that way for transport. Once it arrives at my grand niece’s home, I will put them together and they will fit tight. Really tight. I’ll post another few shots once it has been assembled. 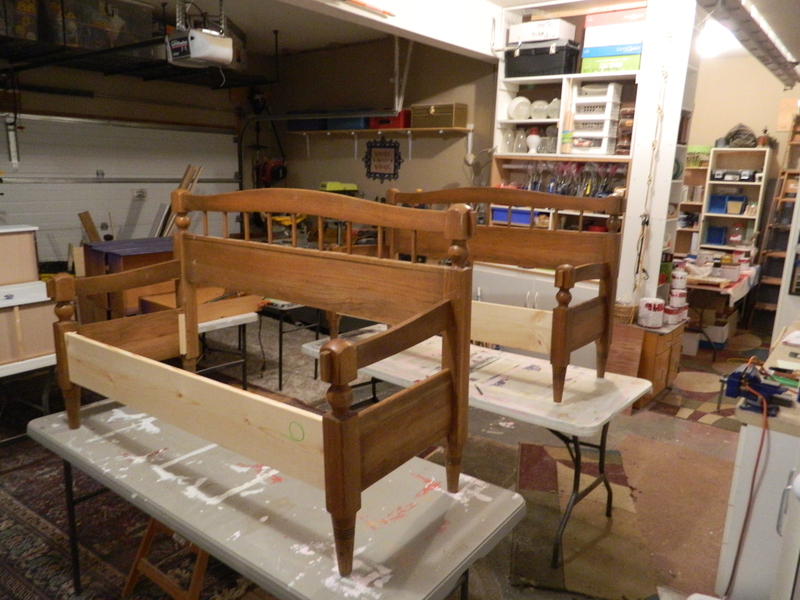 These are the before shots… sorry about the quality of the pictures. But it does give you an idea of what I started with. 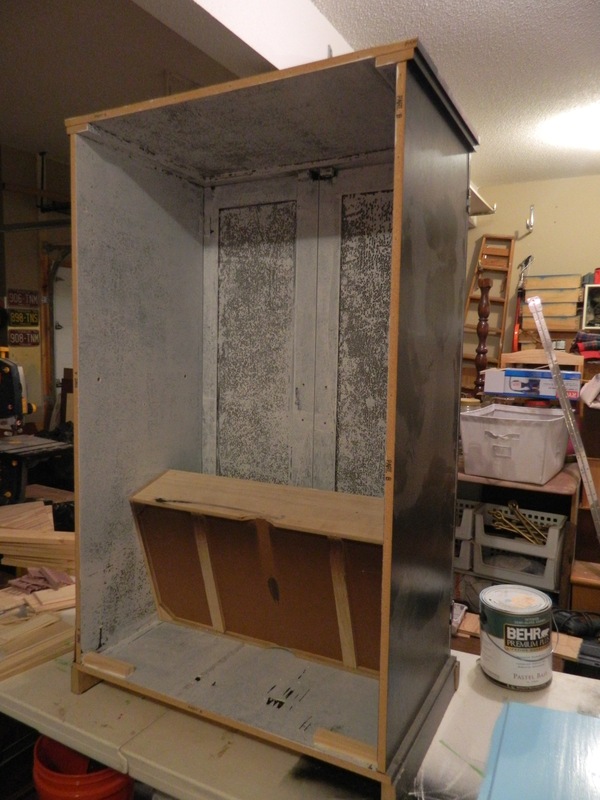 I did a coat of primer and realized that it wasn’t going to be the optimum solution, so I opted to cover the box with something that resembled siding. 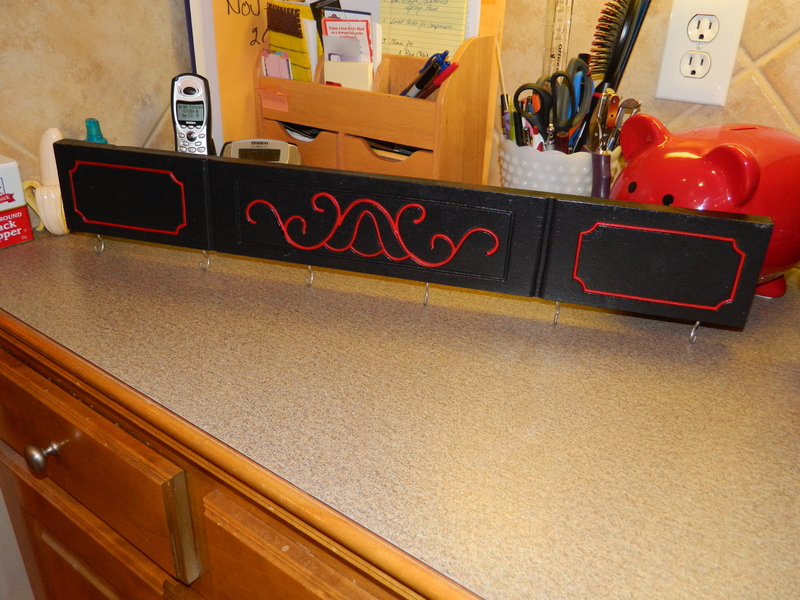 I came up with the idea of using bead board, the kind that comes in 4′ x 8′ panels. All I needed to do is turn it sideways… and viola!, instant siding. 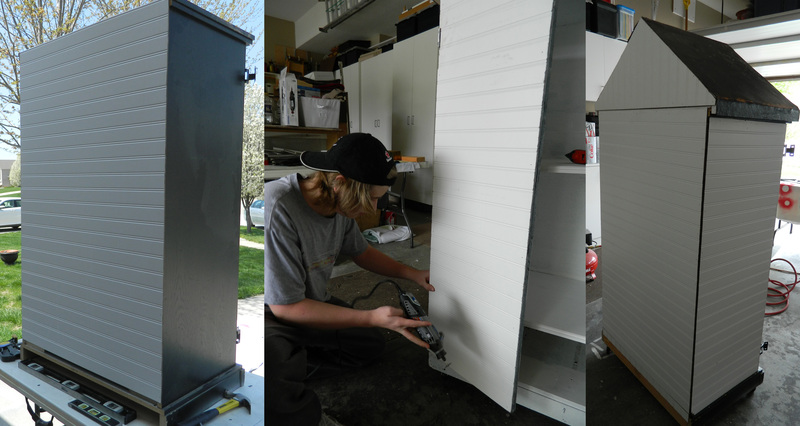 Here are some shots of the process… and yes, the Kid was dutifully helping (adding trim to the doors). Looks great! I added a drawer at the bottom, to hold odds and ends. Modified a drawer rescued from another dresser to fit, added small stoppers to keep the drawer from hitting the back and possibly knocking it off. 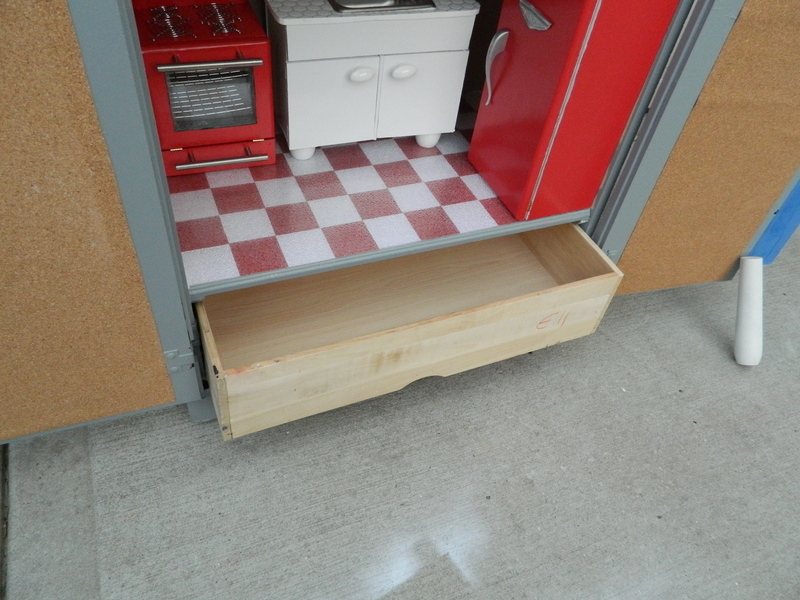 The remaining space was divided in half and added shelves; one above the drawer and one in the middle. You can see how badly the primer was doing on this particular surface. Anytime you would touch it, the primer would scrape right off. 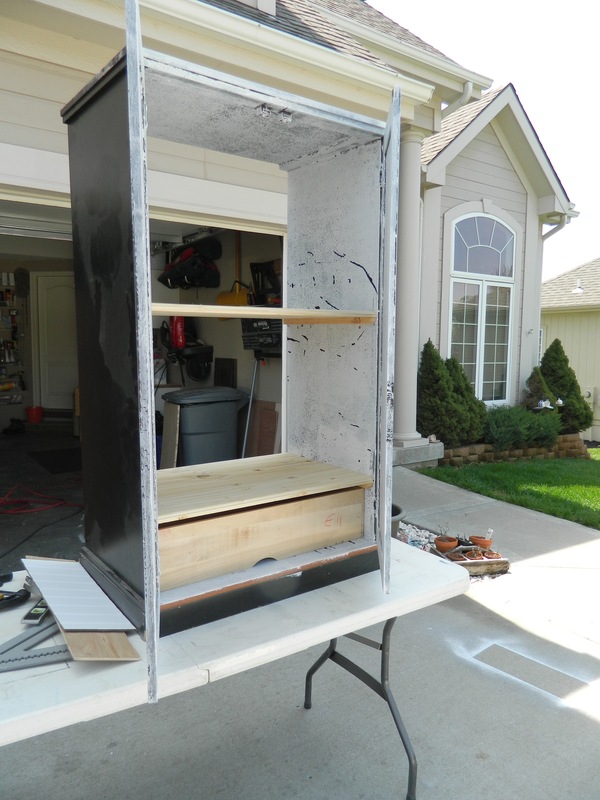 On the inside, I did do several more coats of primer and then a couple of coats of paint. I hope that it withstands the play it will get. 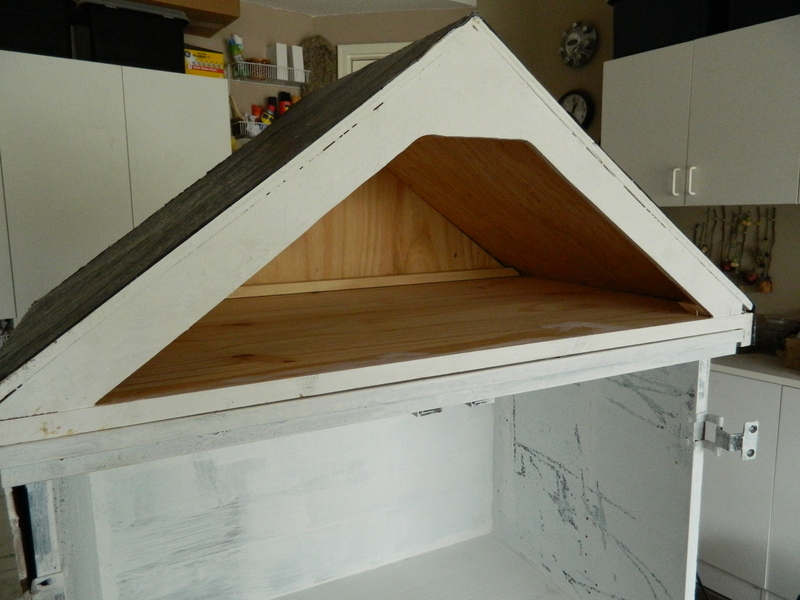 Next step was building the “attic”. It was taking shape as a ‘house, but needed just a little more to really do the trick. That’s when I came up with the idea of having an attic. Also allows for a little more play area. 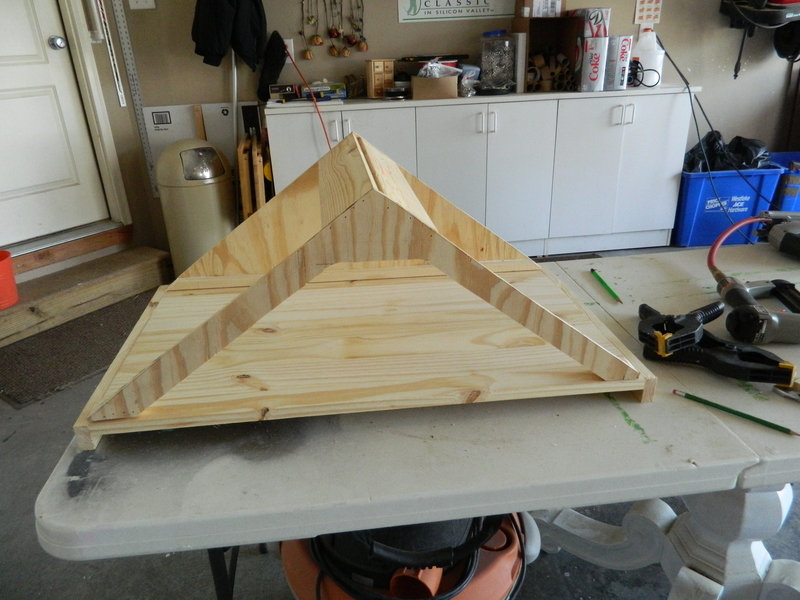 I added the two vertical pieces on either side to keep it stable as it sat on top of the house. With just a tiny bit of sanding, it will go on with some strength, so there isn’t any danger in it falling off or being pulled off. Also why I opted to not photograph it with the attic in place. 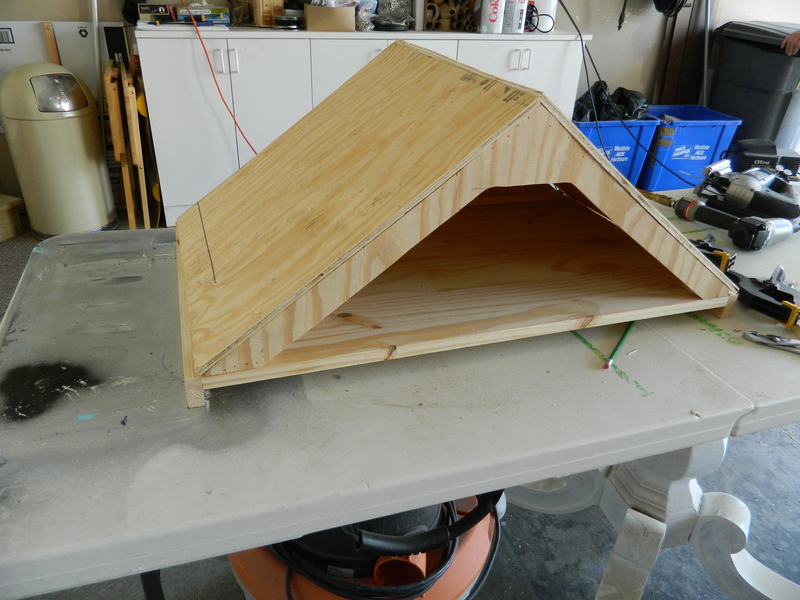 I used actual shingles on the attic, cutting them down to appropriate size and nailed them on. 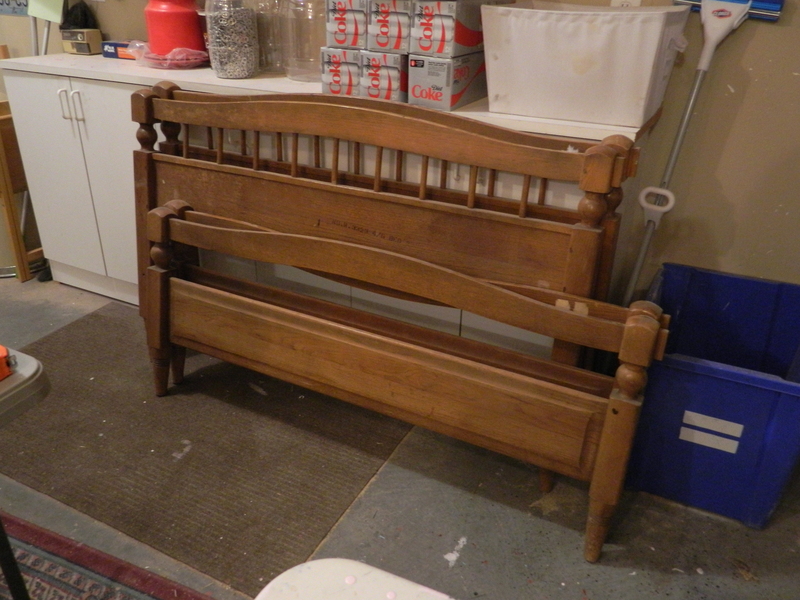 Small wood pieces were painted white to be the trim. For ease in working on this monstrosity, I added wheels. Made is so much easier to move around. All the layers were starting to add real weight to this thing. I built the front door in layers. 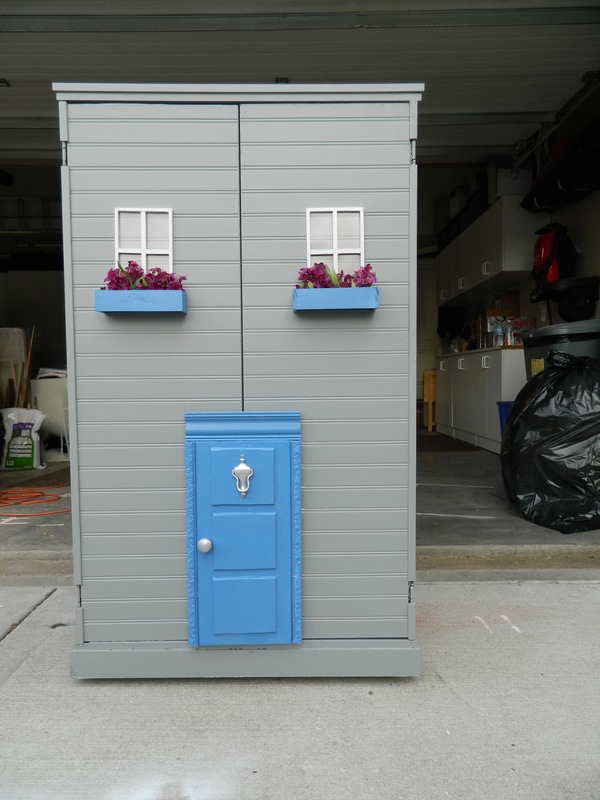 I decided that rather than put handles on the doors to open it, I would place a front door on it. 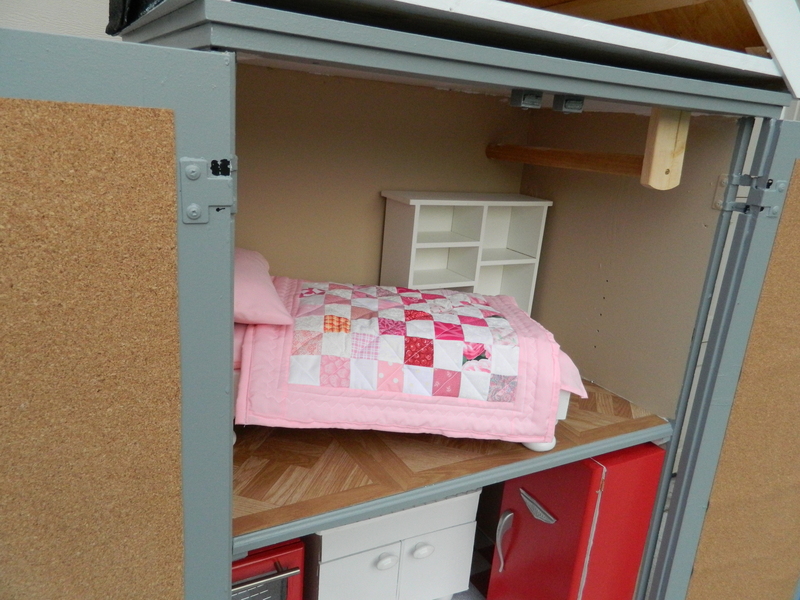 Made it feel more like a dollhouse. And if things got messy, my niece could just close the doors until she had time to straighten things up. 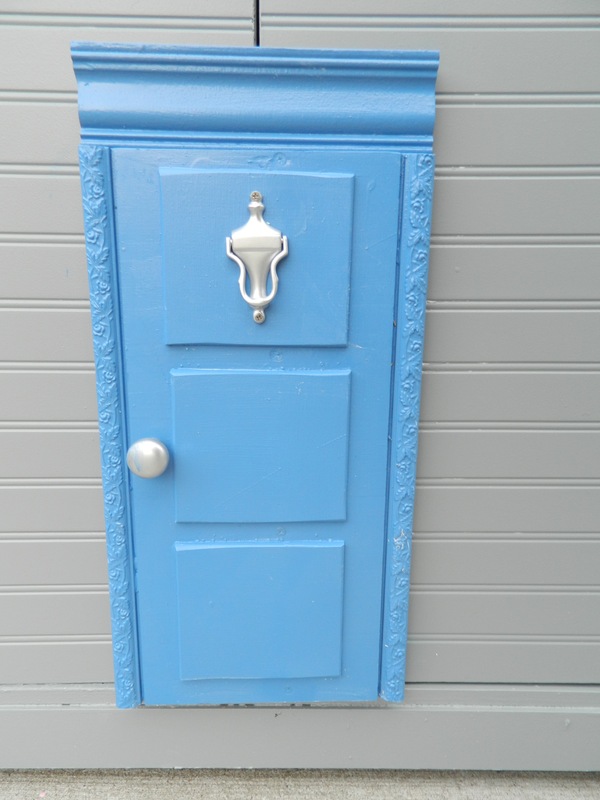 I found this little door knocker at my local Habitat for Humanity ReStore. 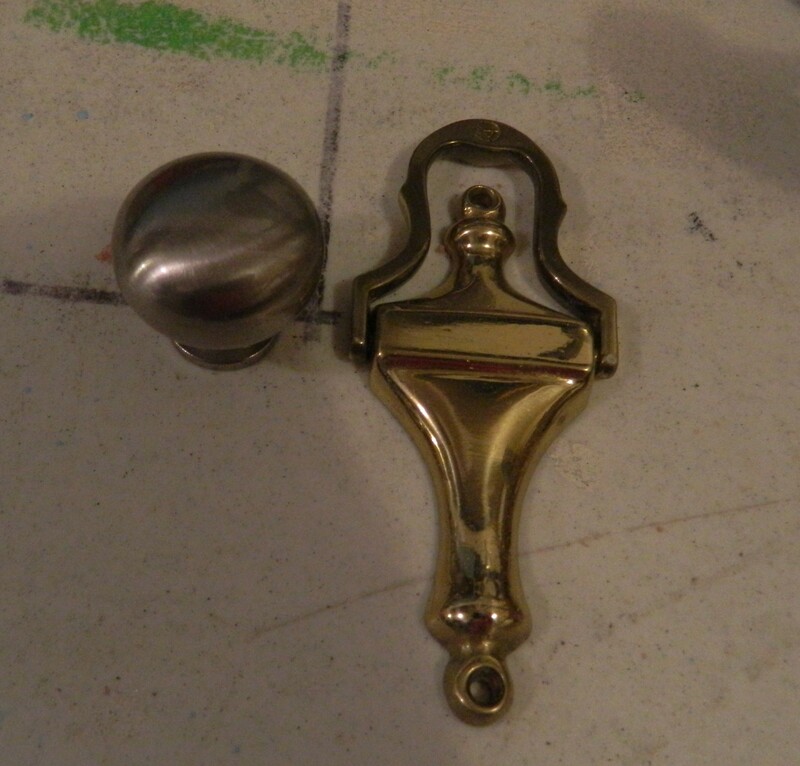 I used this knob I had and spray painted them both the same color silver. 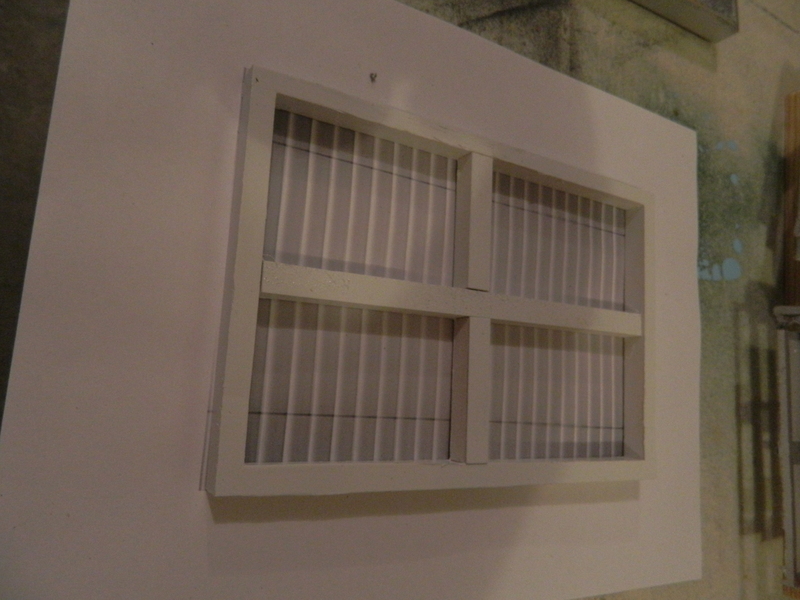 I created little windows for the house, spray painted white. I had thought about putting some sort of photo behind each one, but couldn’t come up with anything that I really like. 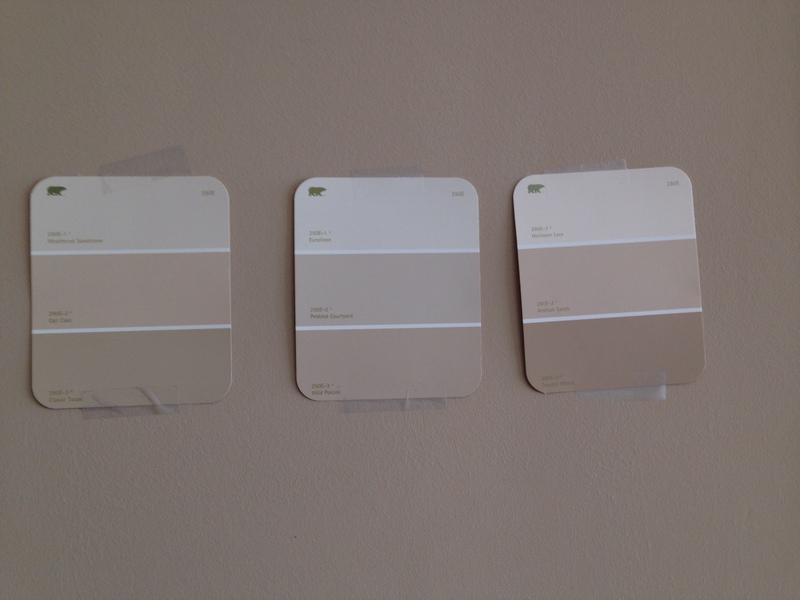 My last ditch effort was to put a photo of mini-blinds, but didn’t like that idea either. So they just went on with nothing. 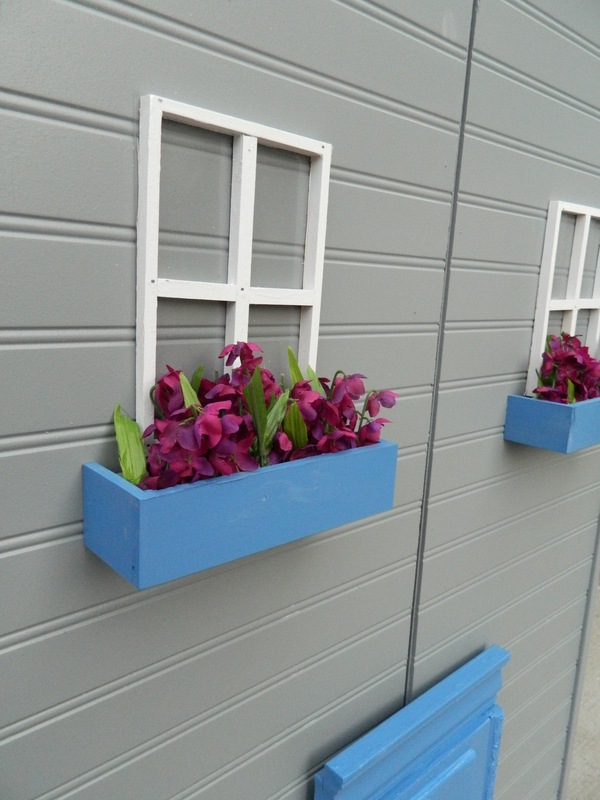 I did create little windows boxes for the front two windows, also painted blue. Added some miniature flowers in purple. Okay, almost done. I added some vinyl tiles to one level and created a checkerboard pattern in red and white for the bottom level. 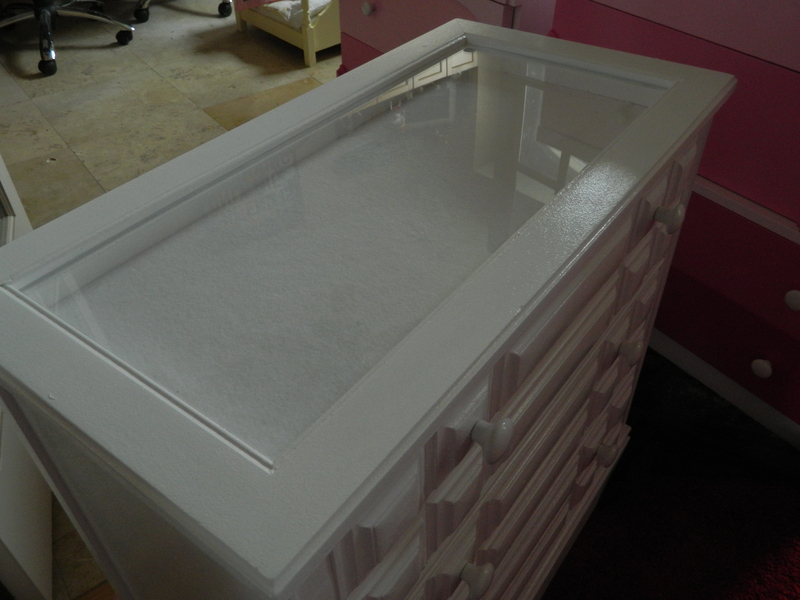 I covered it with a large piece of plexi used to diffuse florescent lighting. I found a piece at Home Depot that had a crack at one end, but a piece large enough remained. The wonderful folks at Home Depot gave it to me free of charge. Gave the flooring an unique look. And with that, this long project draws to a close. I think that we will deliver this in the next day or so. And then I can work on mine! Although mine will be done in a much longer time frame. No hurry to get it done, ya know! I hope you enjoyed this and thank you for stopping to take a look. Will post more photos after it is delivered. And keep making beautiful stuff, just for the sake of it! 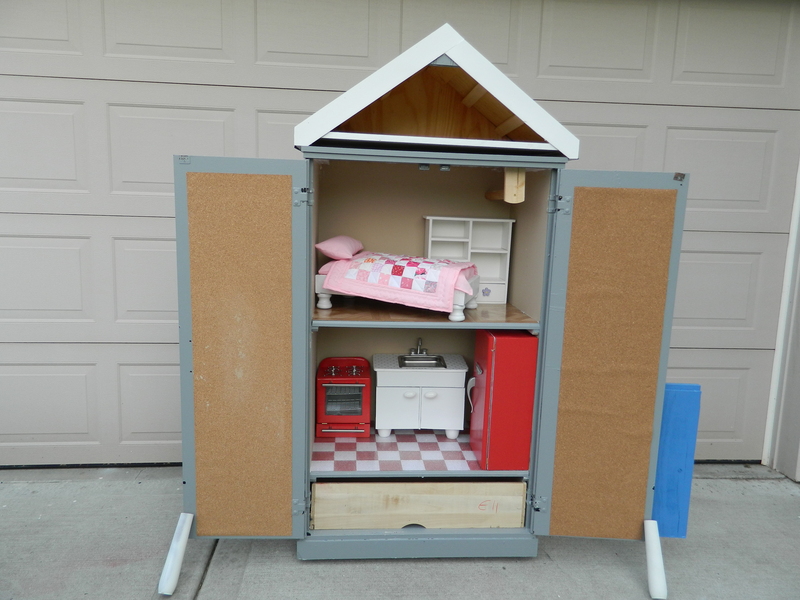 I may have neglected to mention in my last post, that the dollhouse that I am building for my grand niece is for her American Girl dolls. For those not aware of the great doll wars – these are 18″ tall dolls supposed to be about 12 – 13 years of age. There are many less expensive dolls of the same size, such as My Generation and Madame Alexander as well as generic type dolls. You have to be careful when sewing clothing as there can be some differences in their body sizes, such as waist, hips, and leg length. 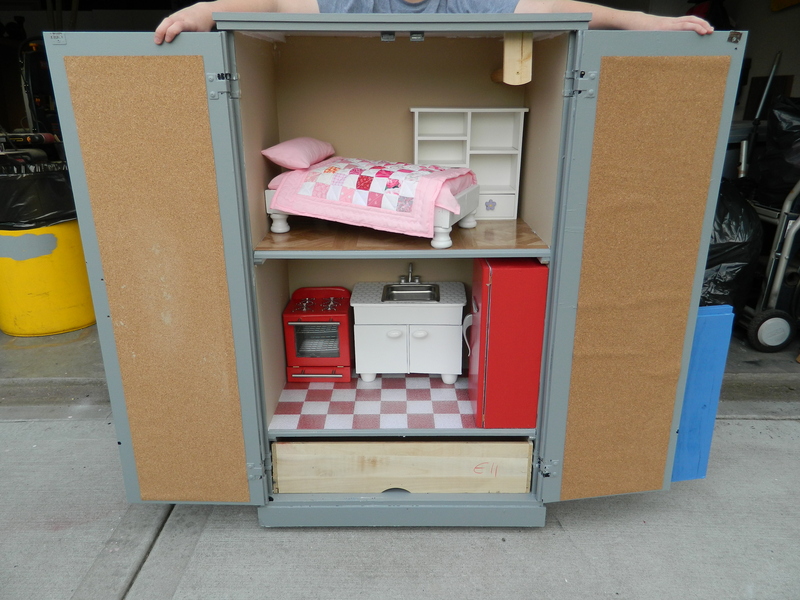 I have come to the conclusion that this size, versus smaller dolls (1:6 scale) or the standard dollhouses (1:12 scale). Things are so much easier to build and sew for. You actually have a greater chance of finding things in a smaller size of everyday objects that will work, like espresso cups and small bowls (like the ones used to hold dipping sauce). 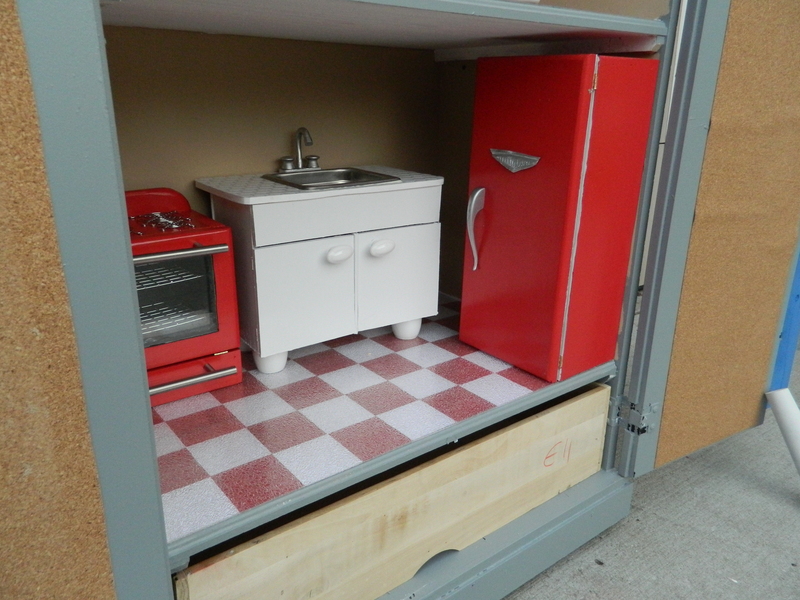 In my last post, I showed you the refrigerator and stove that I build and now is the last piece of the cabinet that I will be doing for my niece’s dollhouse. 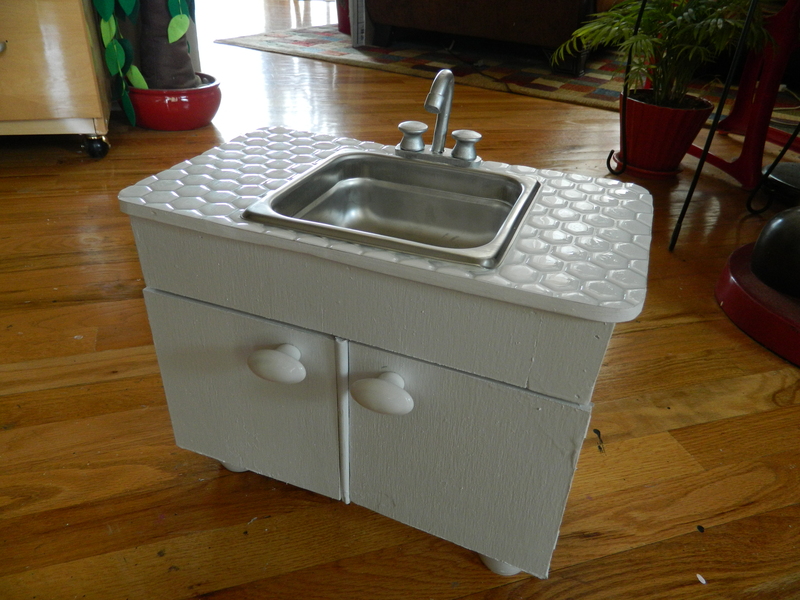 It is a sink in a cabinet combination. 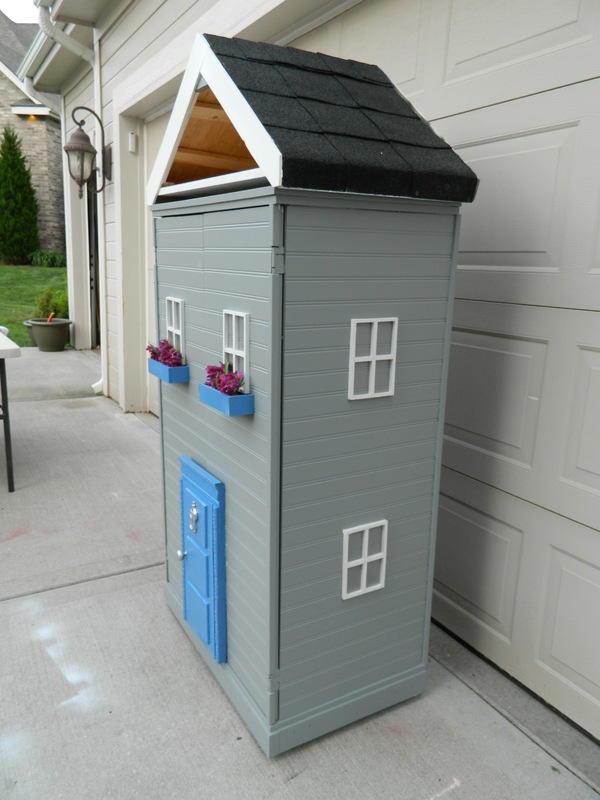 This is a moveable piece (as opposed to the other dollhouse I am building that will have actual cabinetry built in (and that includes upper cabinets). 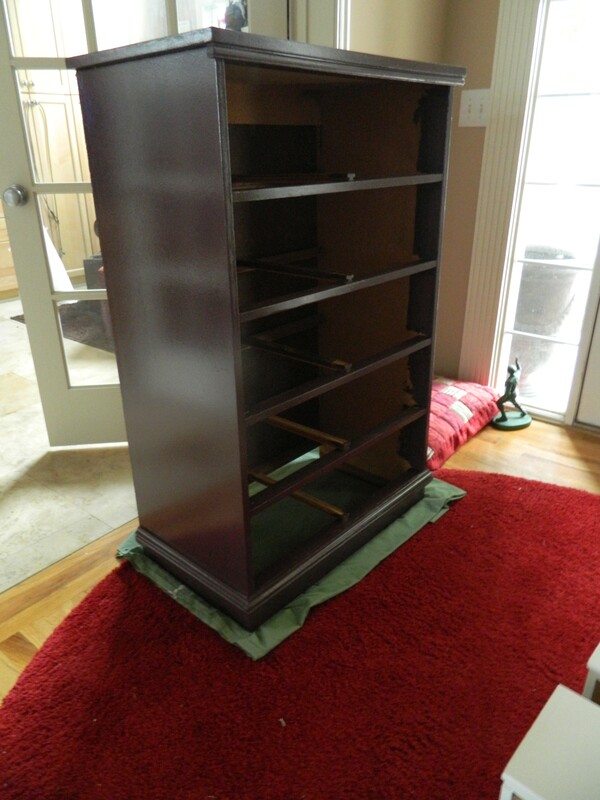 Without further ado: The basic construction of this piece is a drawer that I rescued from a seriously broken desk. 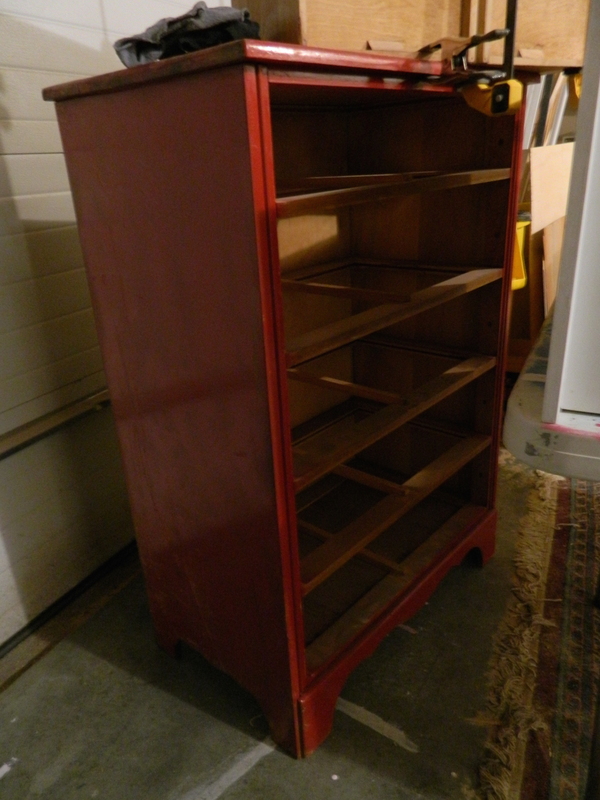 It was in really sad shape, the top and sides were in deplorable condition, so I rescued the drawers (and their hardware). Who knew what can come from a lowly drawer? 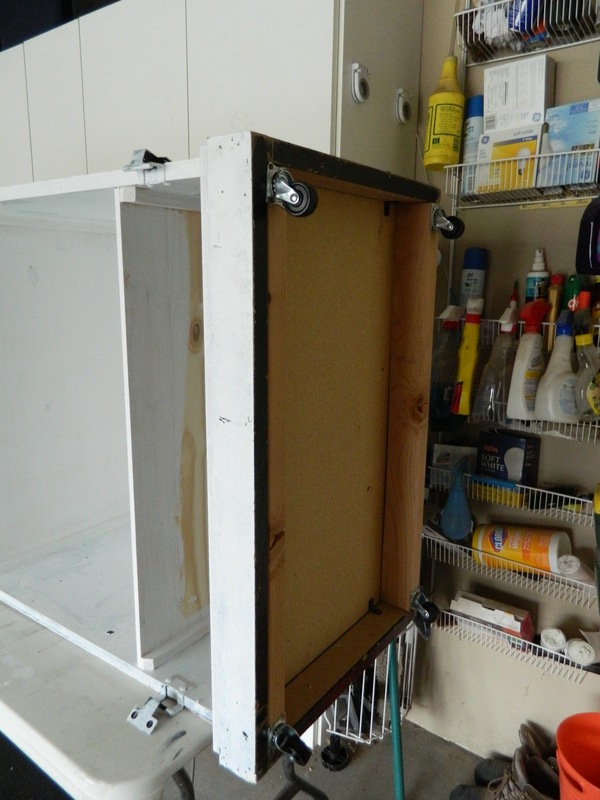 I simply cut doors and the top panel from 1/4″ plywood, the doors are attached with small hinges and the top panel is nailed. 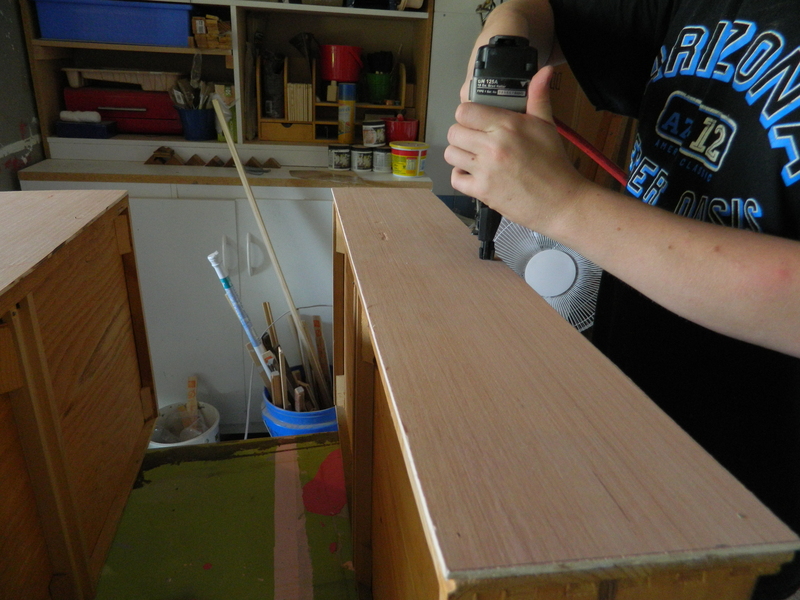 Using the sink to draw the template that had to be cut in both the drawer box and the counter top. 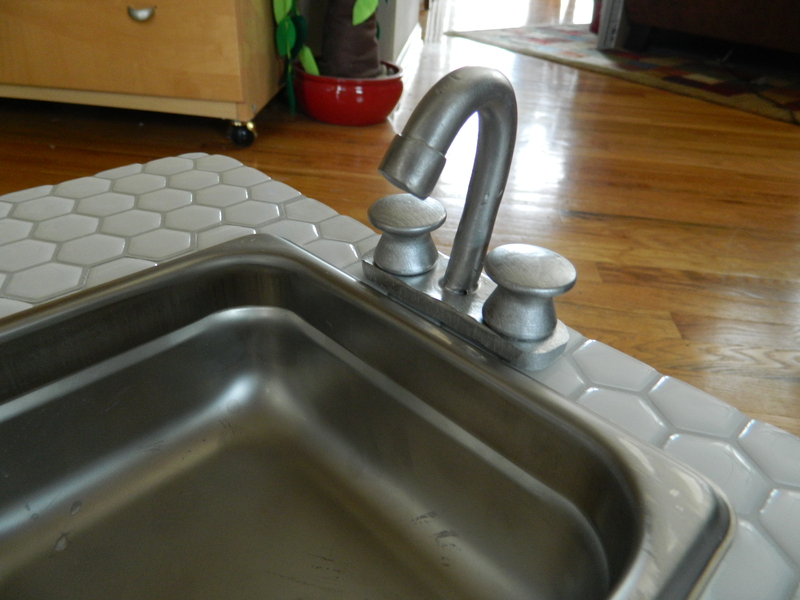 By the way, that “sink” is actually a very small steam table pan called a “ninth size” (6 3/4″ x 4 1/4″) that I bought off eBay for less than $4… and works perfectly as a stainless steel sink. I added a couple of round feet, salvaged from legs of a small table that I also rescued from Craigslist. The counter top has rounded corners and is covered in a very cool faux tile that I found at Home Depot called ‘Smart Tiles’ (you can read more about it on their website here). They’re very think and self adhesive and I think scale-wise works perfectly. 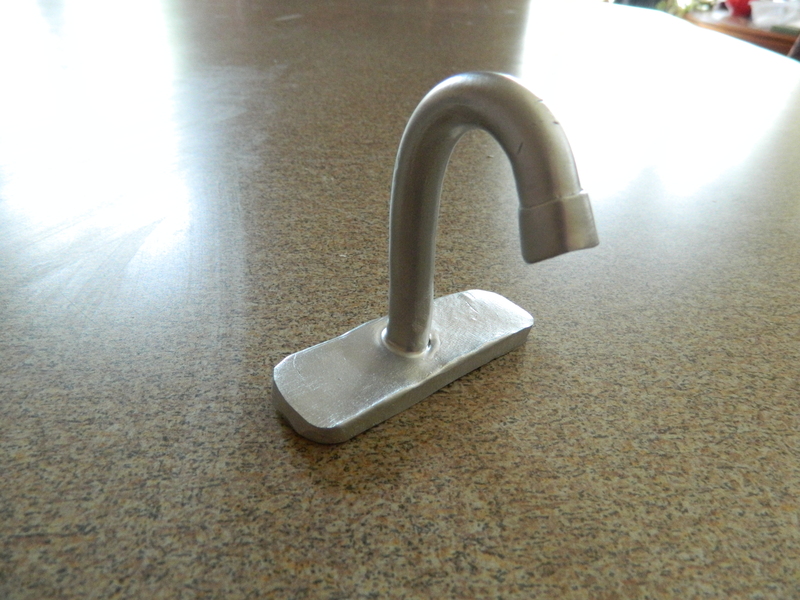 I shaped the faucet and base from polymer clay and then used two small wooded knobs painted silver for the handles. I had accidentally cut the doors just a little narrow, so I inserted a vertical board to fill in the void and also add some stability. I also installed a small shelf to help provide some storage below. A couple of white narrow knobs following three coats of white spray paint over a coat of primer. So very easy and I think it will be very durable. Here is one final picture in its place in the dollhouse. The feet might have made it just slightly taller than the stove, but I don’t think that is a big deal. Little ones don’t seem to mind that the things they play with aren’t perfect. 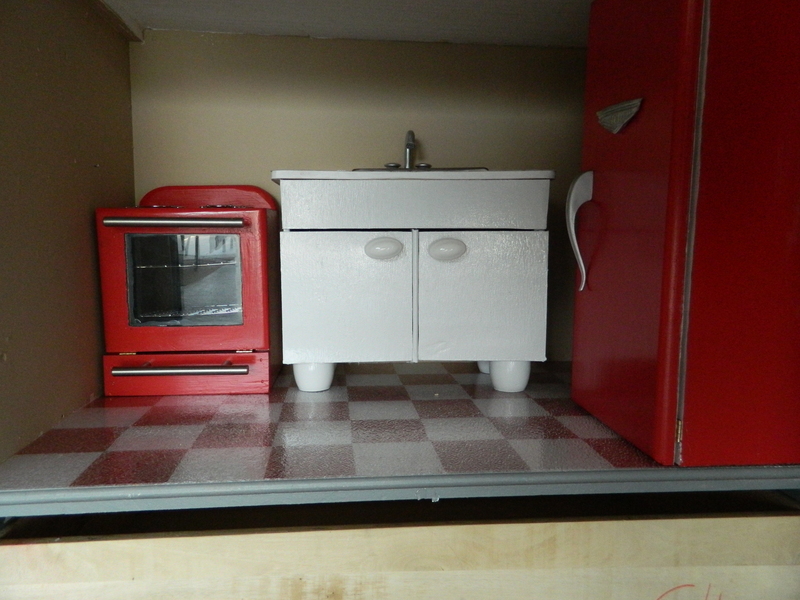 I also have collected some plastic food and pans and although they are a bit larger than either 1:3 or 1:4 scale, I don’t think she’ll mind. Speaking of food, I was playing around with the polymer clay and created some faux food. 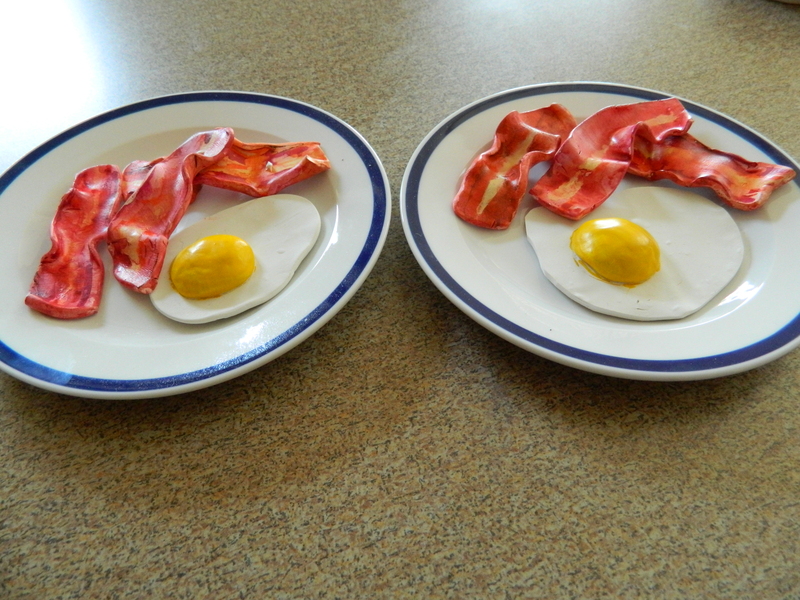 First up was a couple of plates of fried eggs and strips of bacon. It took a while to get the colors right on the bacon and I am still thinking it could use some tweaking. These are the plates I got about 10 years ago at IKEA and have been packed away ever since. They are perfect! 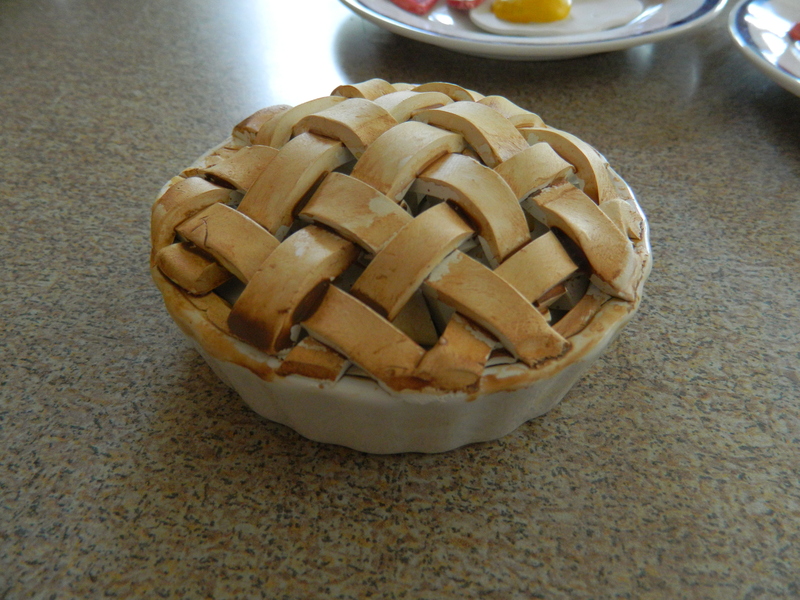 Then I worked on a pie, I guess it would be apple pie based on the lattice crust on too. Using a small baking dish – yes, that’s a real ceramic pie dish – I just cut a bunch of shapes that would sort of look like fruit. Then placed them on top of the bottom crust and then wove the top lattice crust. Other than not using real food, the steps were very similar to that of making an actual pie! I used watercolor paints that I thinned way down and then poured into the pie to get coloring throughout and then painted the lattice crust. 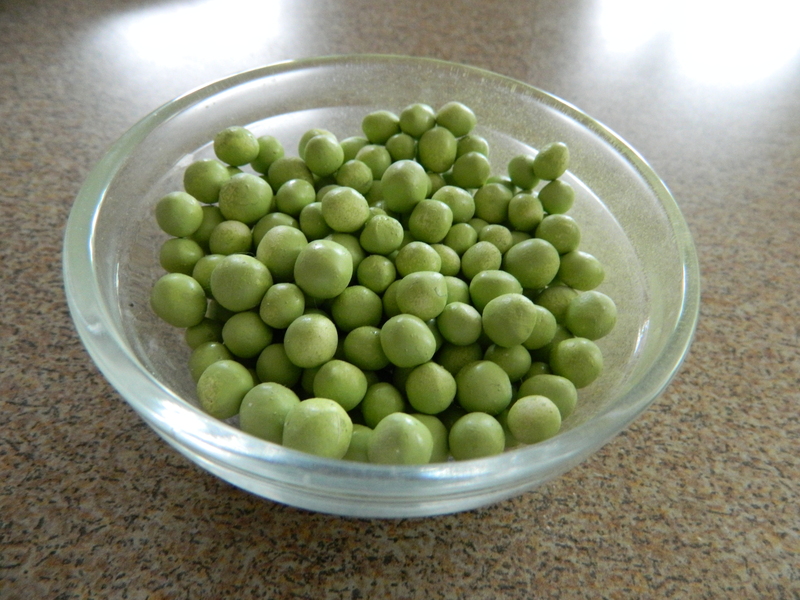 Oh, I also sat and rolled peas from the polymer while the Kid and I watched a movie. I had sort of expected for them to fuse together when I fired them, but they didn’t. 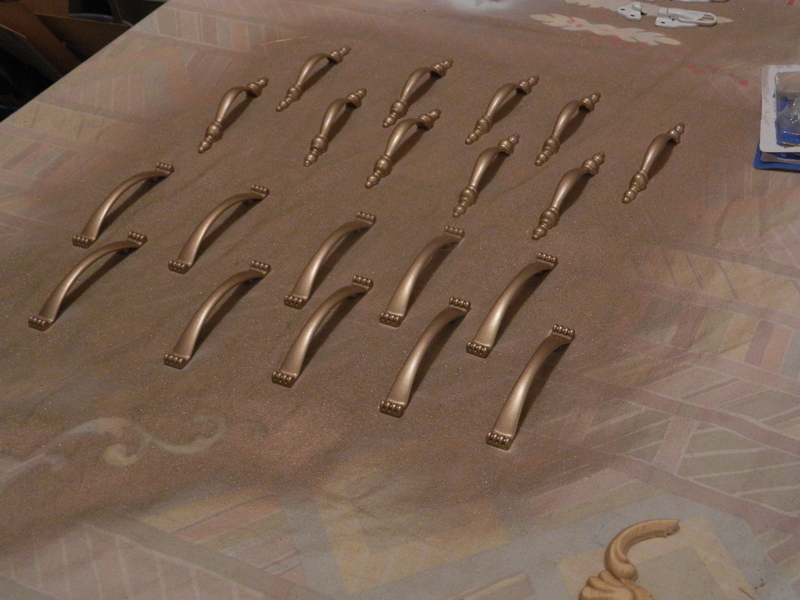 I spread them out on a painting cloth and using an awesome green, spray painted them. I had to keep rolling them around, trying to get all of the sides and I think I finally made most of them the same color, but since variations are natural in nature, I think that the ones that aren’t solid green make the whole bunch perfect! Turned out pretty cool, if I have to say so myself. 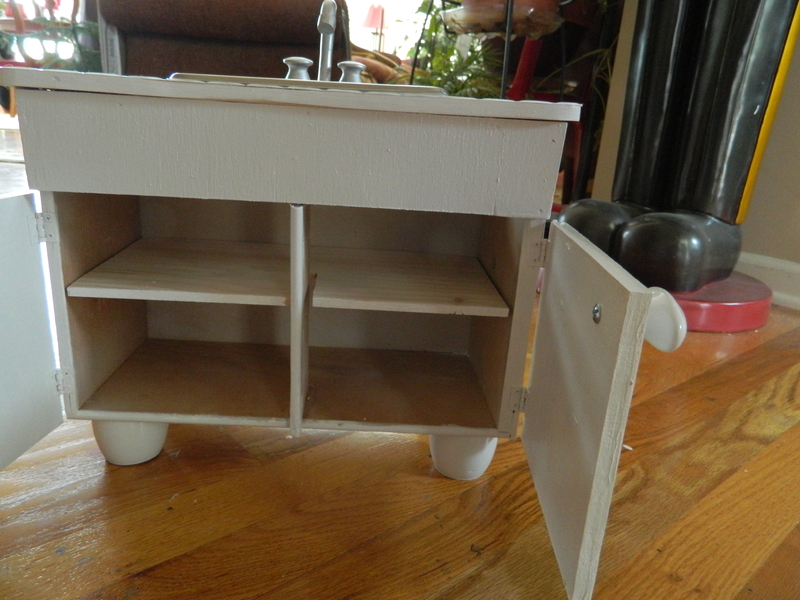 I think that going forward with work on my dollhouse, I will continue to create food, both for me and my grand niece. Its fun and relaxing as well as challenging to keep coming up with more food items. Think I will work on some boxes and maybe canned food, reducing the size of labels should be pretty fun. 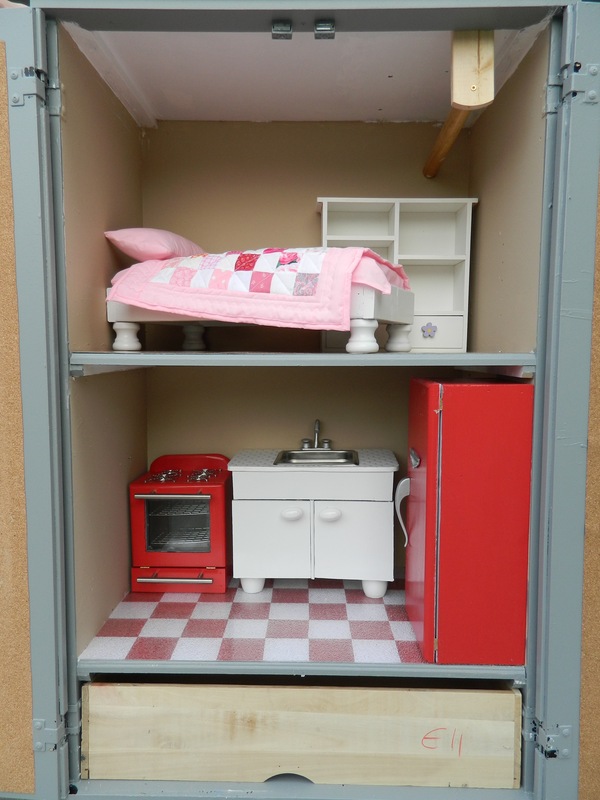 Tomorrow I will posting the final shots of the dollhouse. And a week later, we’ll load it into the truck and head to Des Moines and deliver it. I am planning on including some pics of the by grand niece with the final product set up in her room. I think it will be a blast. Thanks for dropping by and remember to keep making beautiful things!